Being Changed from the Inside Out | A blog written by Lane Widick about ministry, Kingdom living, family, and life. Sometimes, you just have to make a change. So we made one – and while not a big deal for some, it’s a pretty dig deal for us. We cut the cable cord. More and more folks are cutting the cord. Most people seem to be doing it in the name of saving money. I’ll admit, that was part of the reason we did it. We were paying $160 for Frontier’s cable and internet package. We’ll now be paying about $60 for just the internet. We simply weren’t using it. But then there’s the other part of it – most of what is on television is nothing but garbage. We have a few things we would routinely watch, and probably still will continue to watch – but it was time to say goodbye. All the new streaming services, you can cancel without contract. Come and go as you please. Pay for what you want and nothing more. There are versions of just about anything and everything you could ever want out there – and I by no means am endorsing one over the other. The only thing I will definitely make sure of is when college football rolls around, I’ll have access to all the ESPNs and SEC Network. 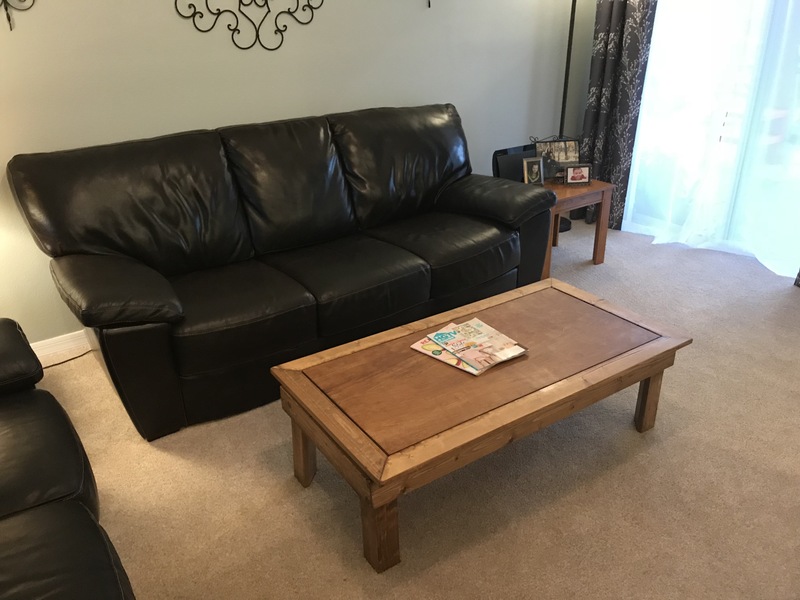 I’ve been a subscriber of DirecTV, Dish, Comcast, Charter, CenturyNet, Spectrum, and Frontier – and honestly, I mostly just watch network television and ESPN, along with the occasional TLC/HGTV/DIY networks. When Josie was younger, we frequently would watch Nick Jr. and Disney Jr., but now that she’s older, we don’t. Really, when I think about it, we spend a lot of our TV time watching the old “Little House on the Prairie” episodes we bought on DVD for our daughter. Those were just great. So, if you’re thinking of cutting the cord, tell me about it. Already have? What has worked great for you? 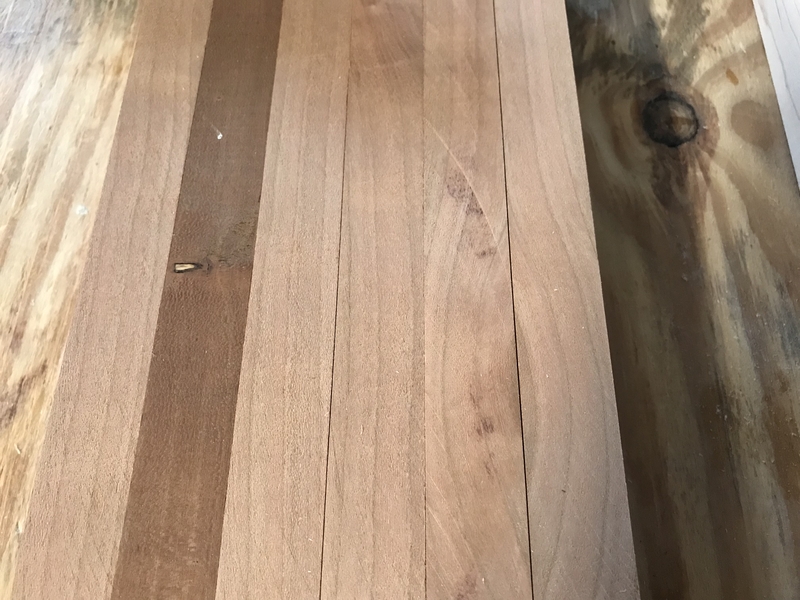 Apparently, in woodworking, a “rite of passage” is a cutting board. 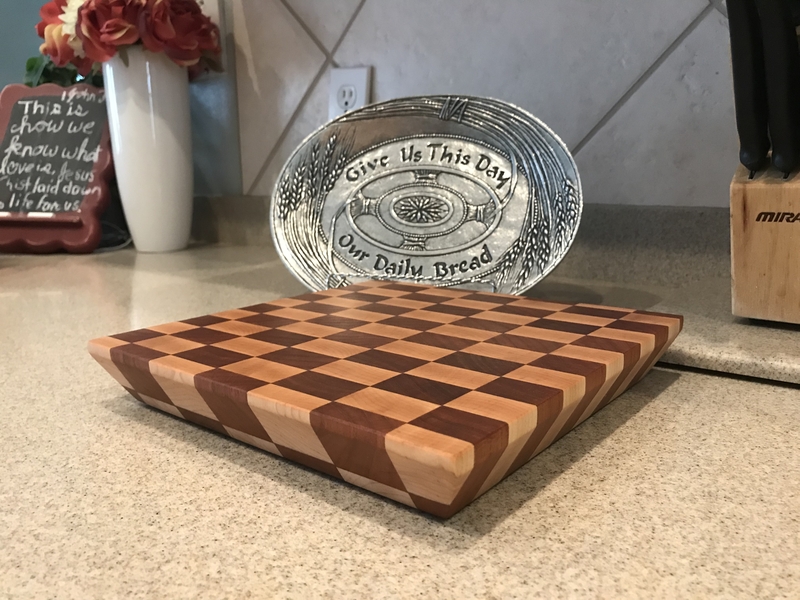 There are many, many, many different styles of cutting boards. Edge grain, end grain, cut out face grain, but the most enjoyable ones to look at seem to be the “end grain” variety. 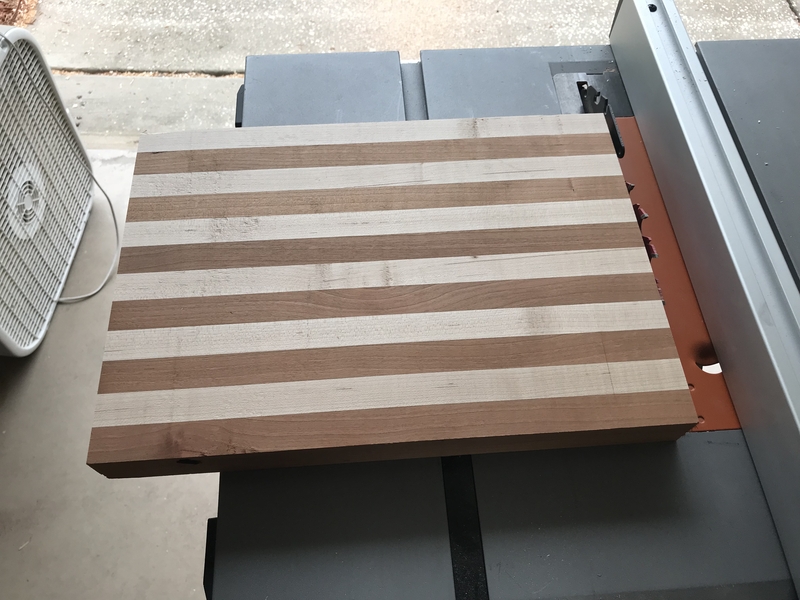 A few weeks ago, I purchased some maple, cherry, purpleheart, and wenge wood that I thought I would eventually work into a cutting board. 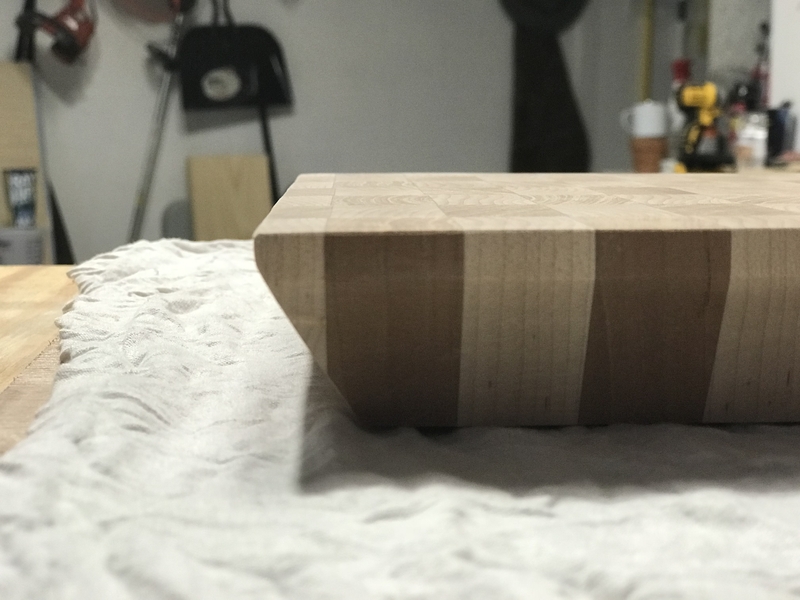 For my first cutting board, I chose maple and cherry. 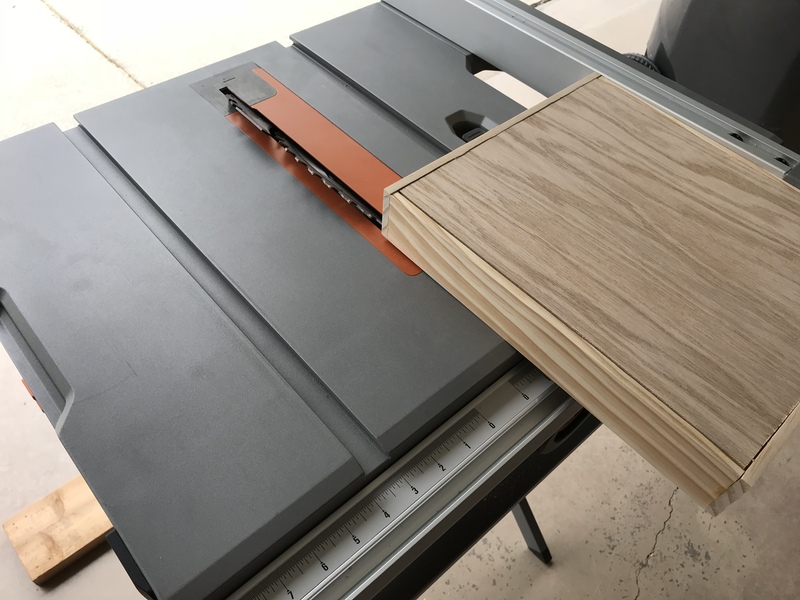 This would be my first time to use my new “planer” – which I bought from Butch, a guy at our church who is a phenomenal craftsman that used to build homes, and now builds custom furniture. 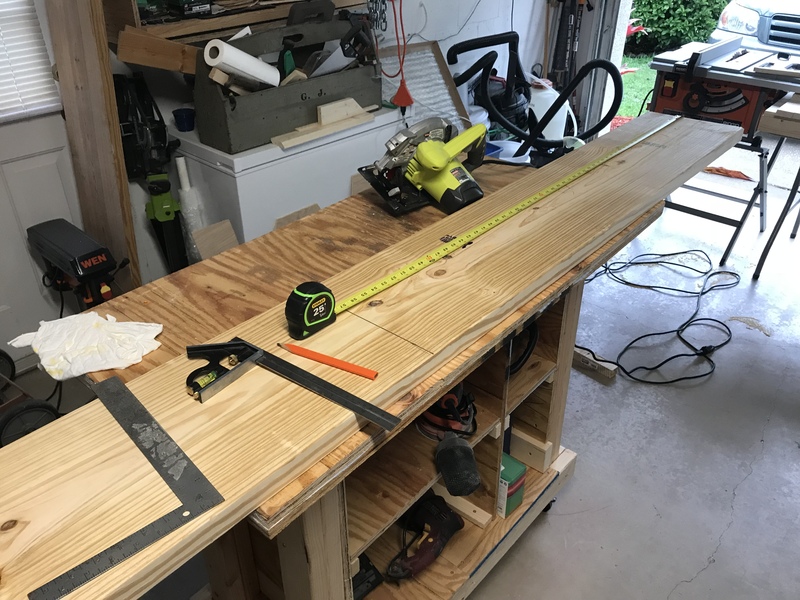 He had an old 10″ planer he was no longer using. 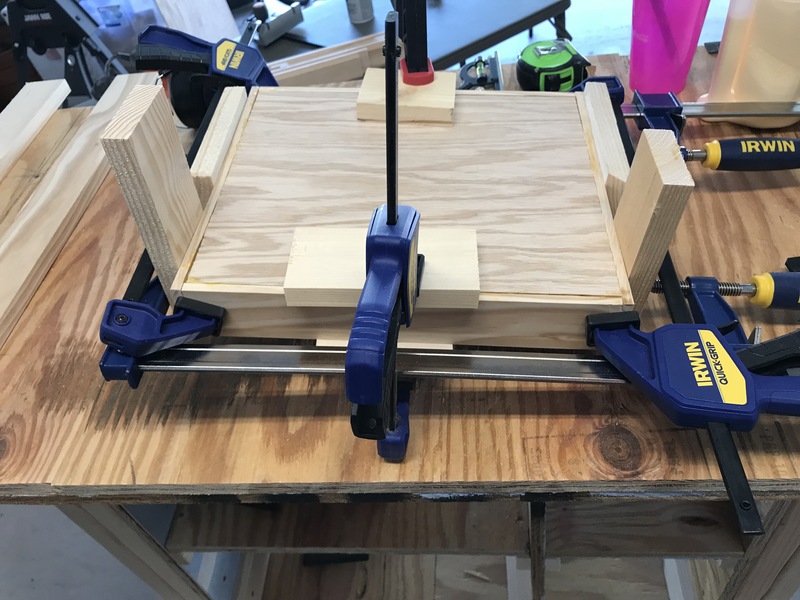 I bought it from him, and it is going to change how I do my woodworking. 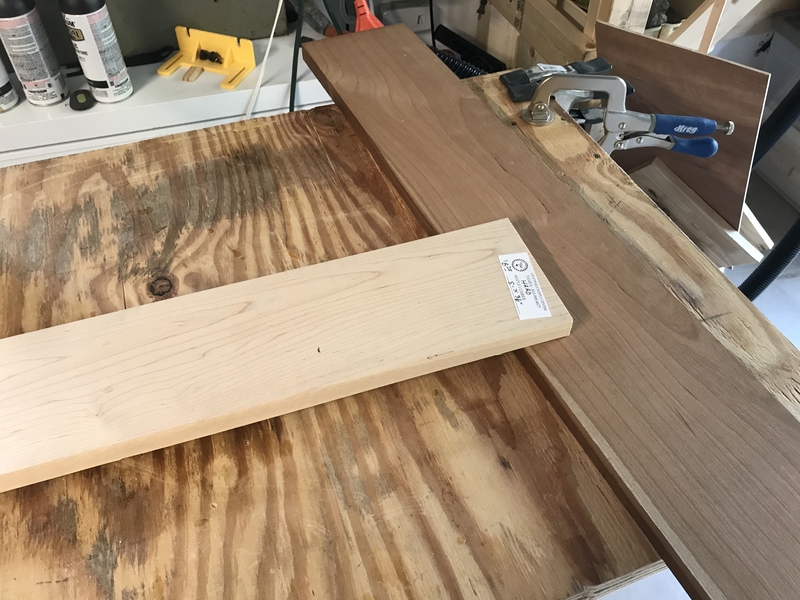 I cut the maple and cherry into equal width strips. 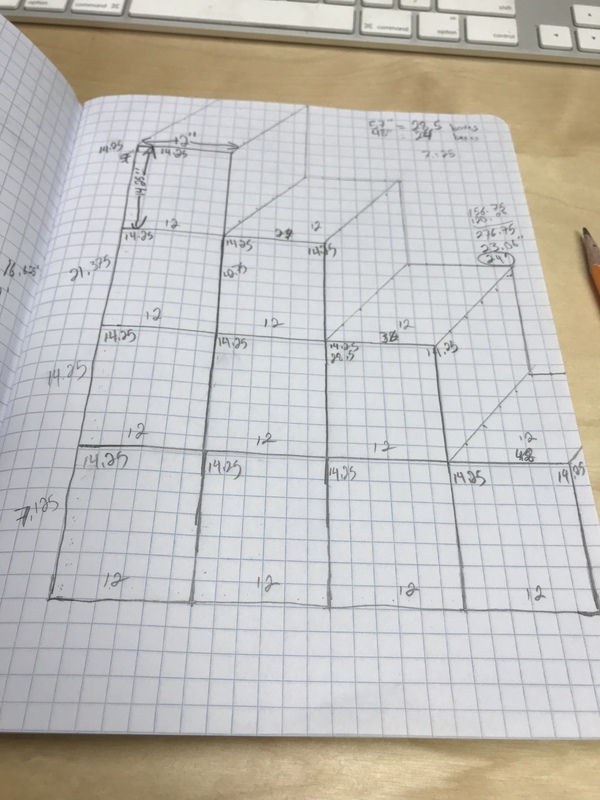 My planer is only 10″, which means I can only make a design that is 10″. 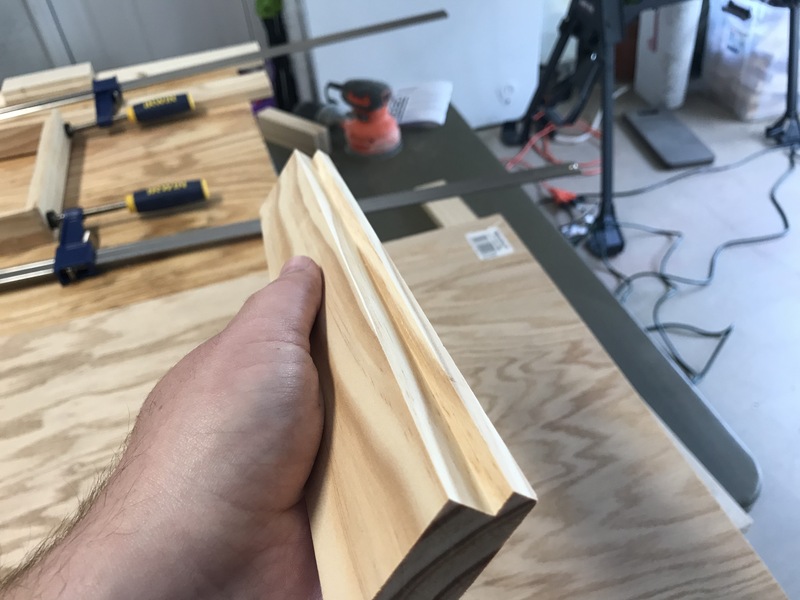 I glued up my strips. 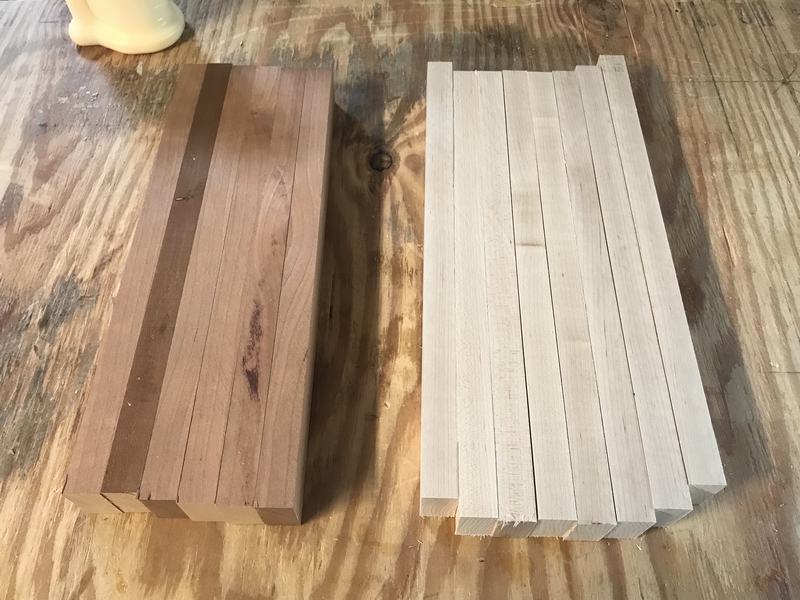 And after sitting overnight, I cleaned it up, ran it through the planer, and cut them into strips again. This time, I turned them on their edge, and glued them up again, after making the pattern I wanted. 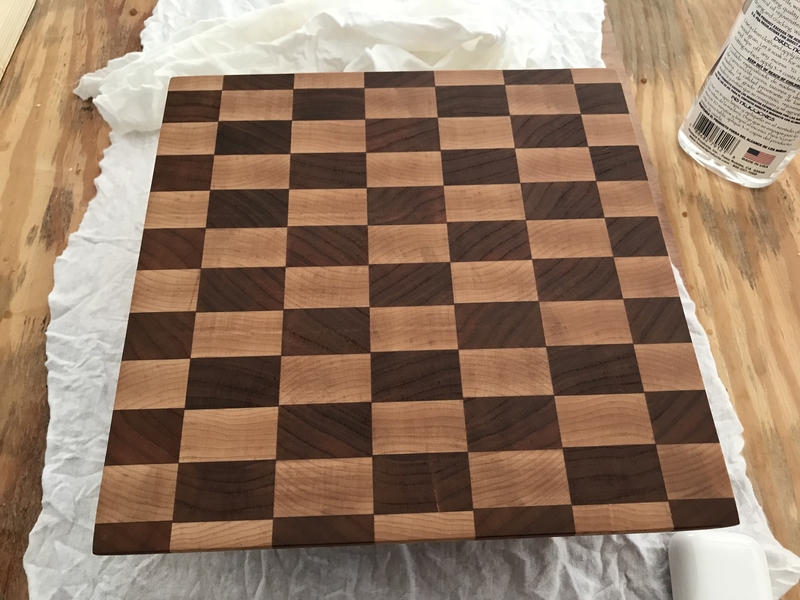 I decided to go for a fun checkerboard design. 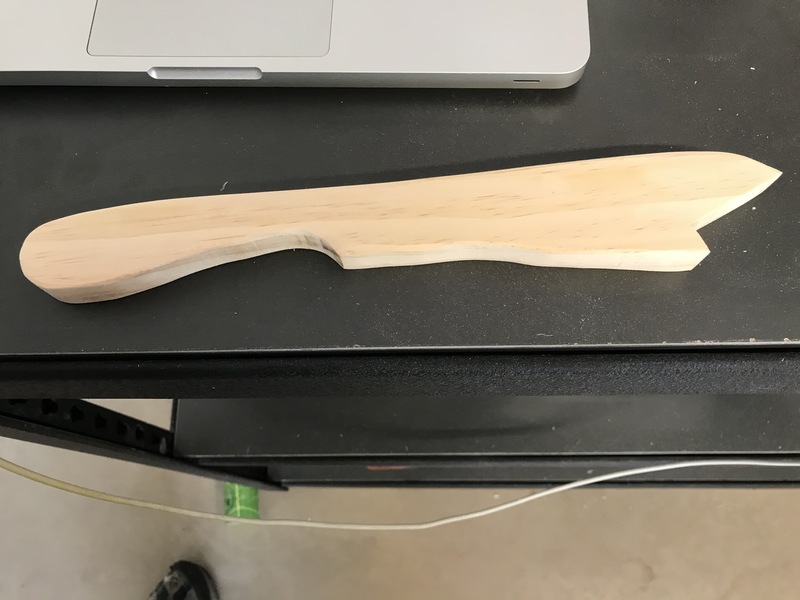 After sitting overnight, I cut it into the final shape, trimming off the edges. 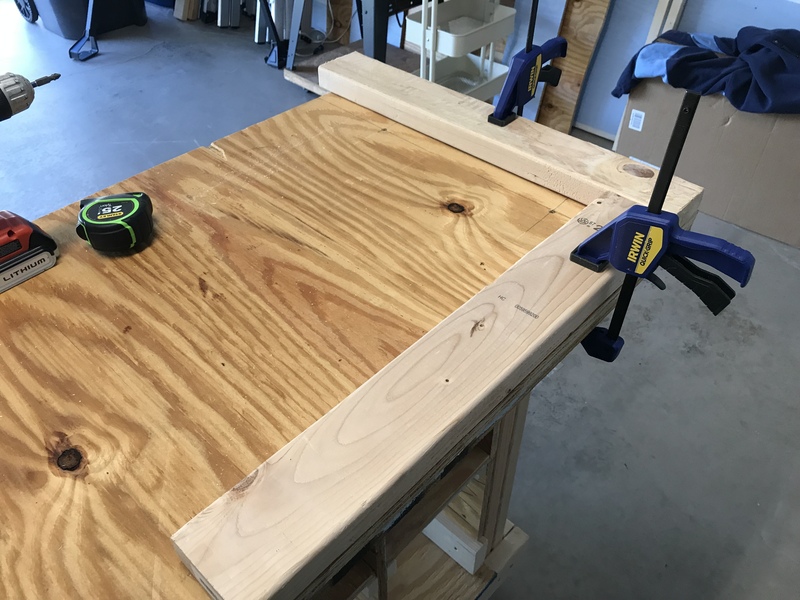 It was here that I discovered my miter gauge was horribly cheap and not square at all. 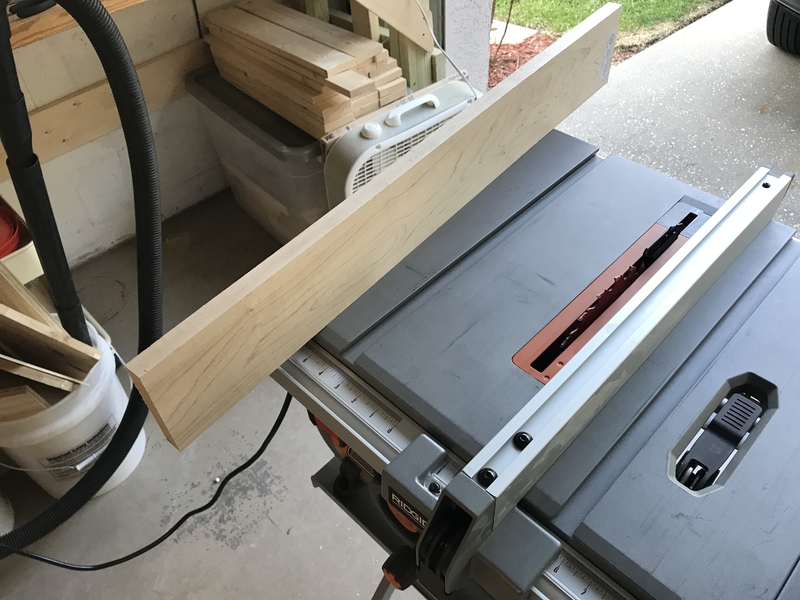 After many attempts – I ordered a new miter gauge. I’ll show that at a later project. 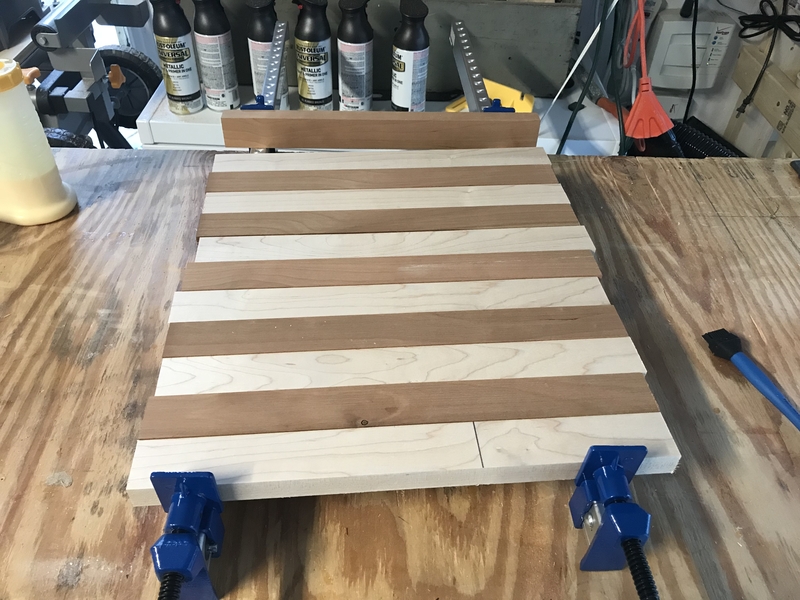 After I finally got the board sides straight, I realized I needed a way to easily pick up the cutting board. 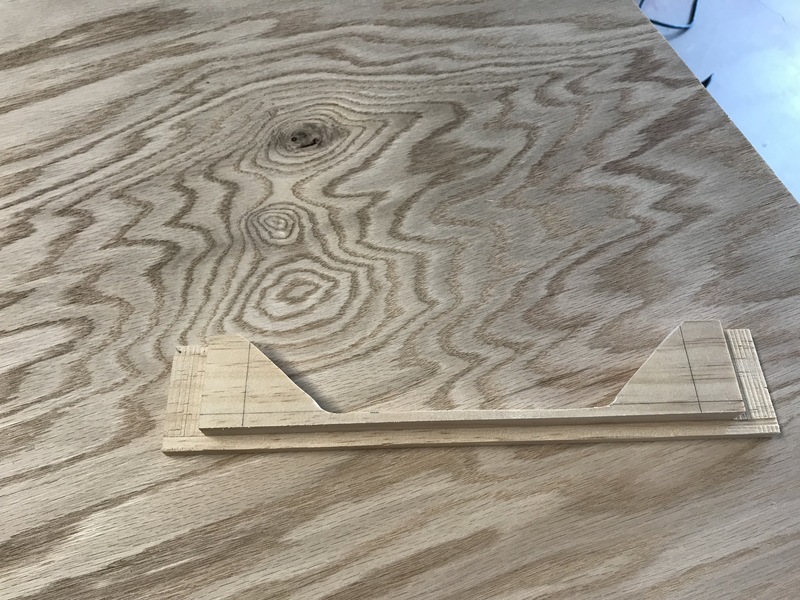 Since I still don’t have a router to cut handles into the sides of the board, I decided on making a bevel cut, so it could easily be lifted. I sanded it down, and it started to look even better. 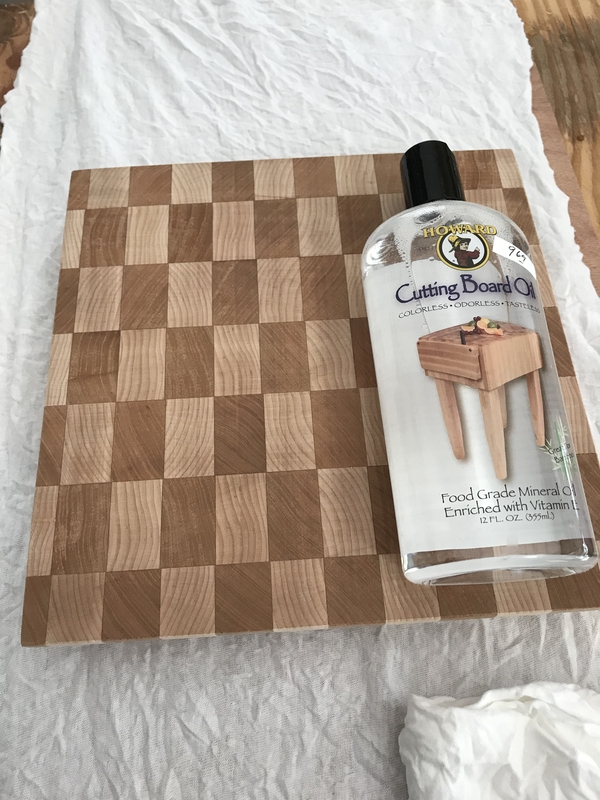 But the real fun is after you put the butcher block/cutting board oil on it. Here it is in its final resting place in our kitchen. 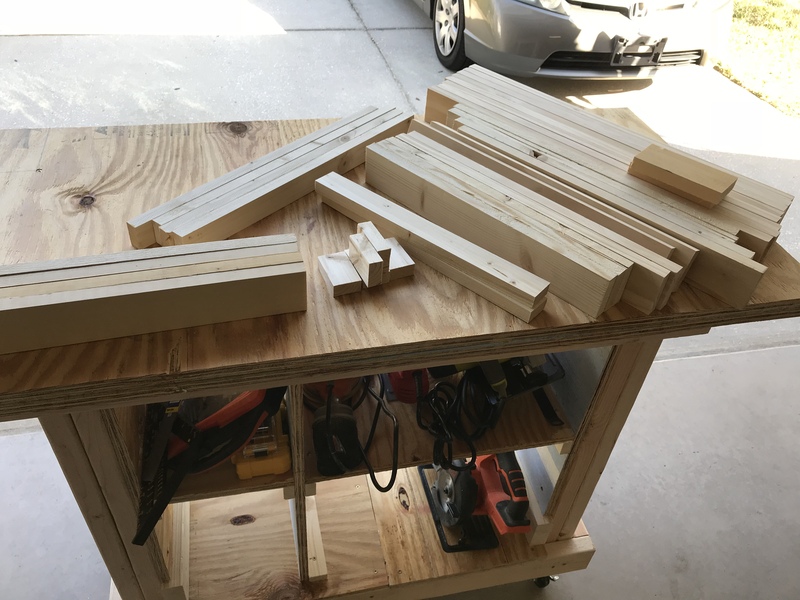 Let’s start with project #12. Here in Florida, a lot of homes have these ledges around the house for you to put knick knacks and stuff on. I’ve dreamed of building something to put up there – and finally figured out what I wanted to do. I initially saw something similar to this on April Wilkerson’s Youtube channel. 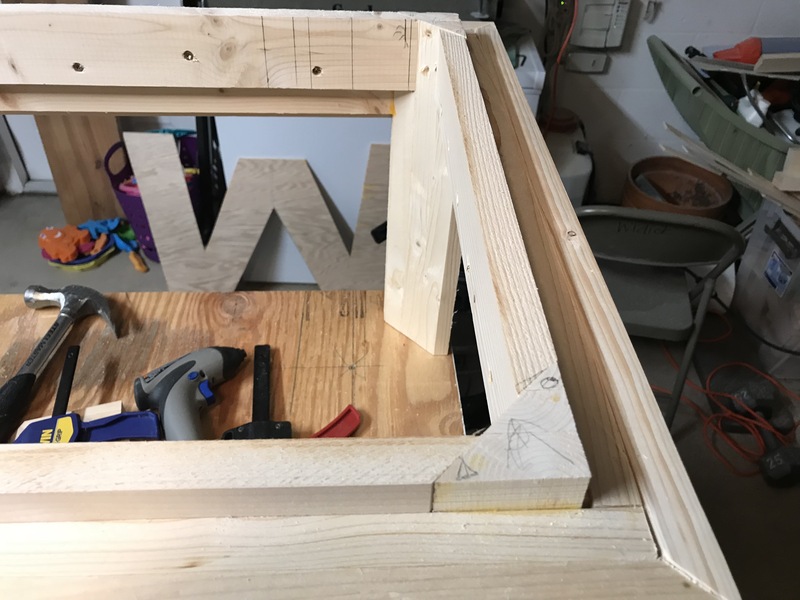 I cut out a “W” from some scrap plywood probably 6 months ago. This is something I’ve wanted to do for a while. 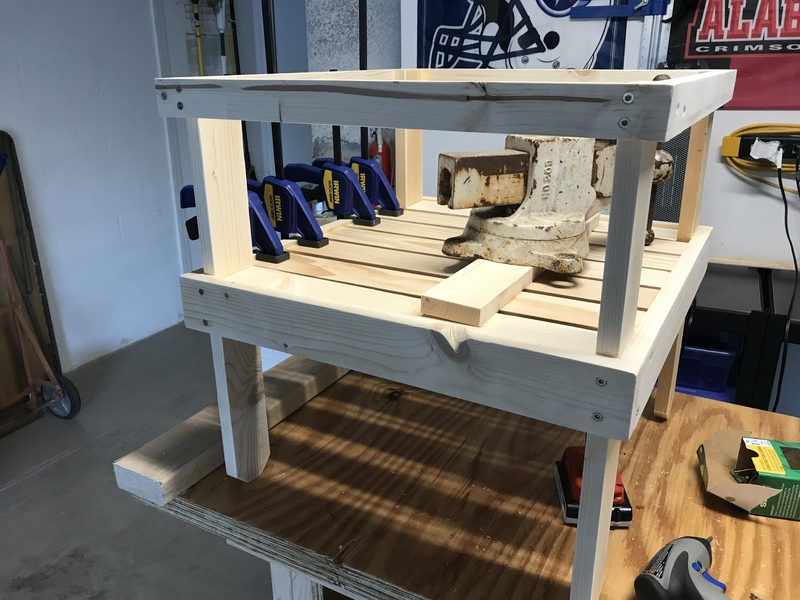 Problem is, I needed some scrap wood for it. Well, it takes a while to accumulate scrap wood! I took the scrap wood after I had enough to do the project – and painstakingly assembled it on the “W” like a puzzle. 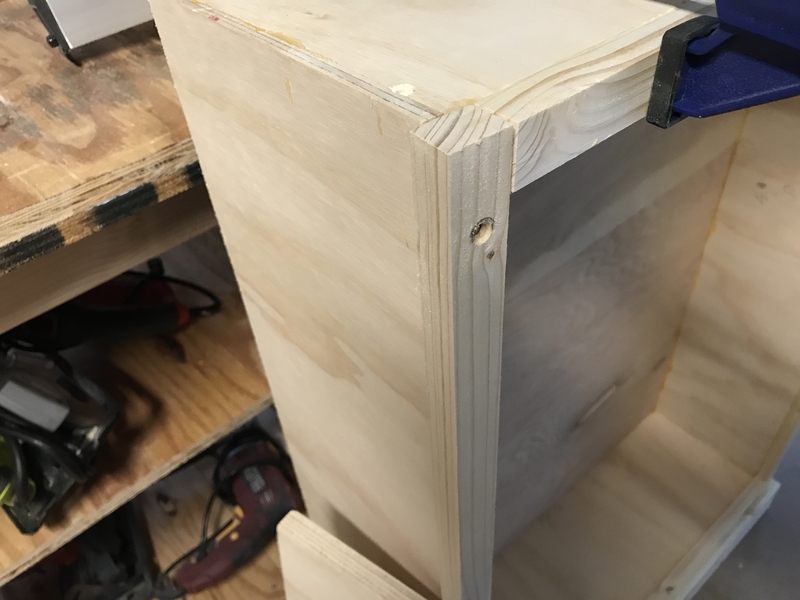 Since I don’t have a brad nailer of any type, I had to rely on good ole’ wood glue, which made it take a little longer. 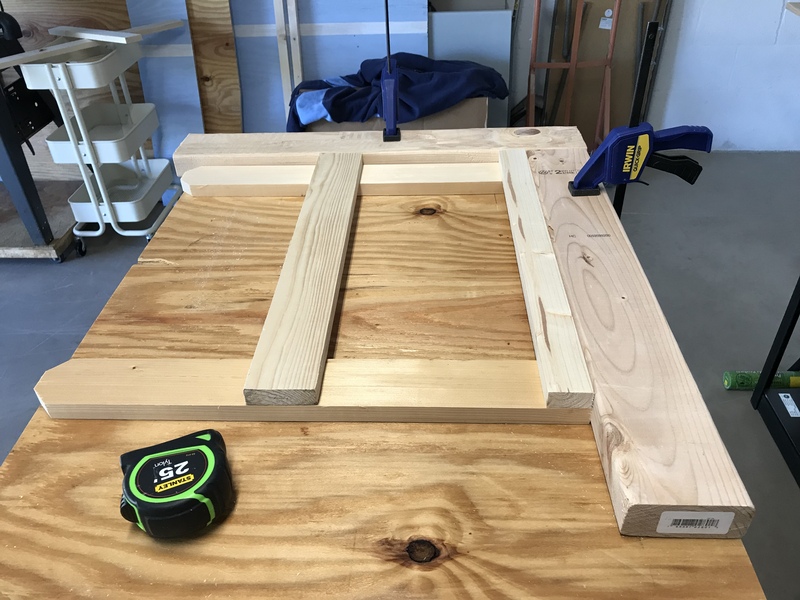 After all the pieces were glued on and secured – i took the jigsaw and cut off the edges. Then, after some vigorous sanding – i applied some dark Danish Oil. 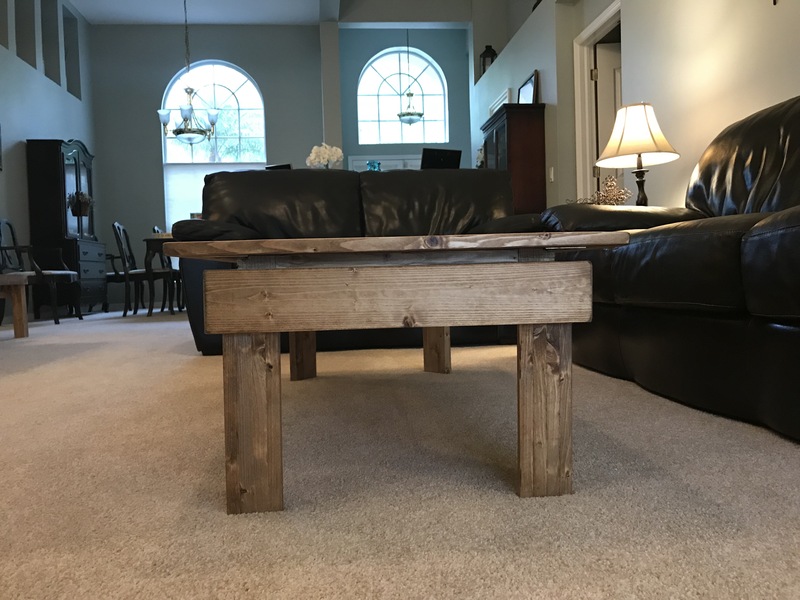 A couple of months ago, we had our annual church auction to raise money for our Honduras Trip that members of our church go on to do things for people of that nation. For the auction I made three things – a tic tac toe game, a necklace holder, and a doll cradle. Here’s the doll cradle: The first one I made actually broke when the buyer got it home — and I realized why. 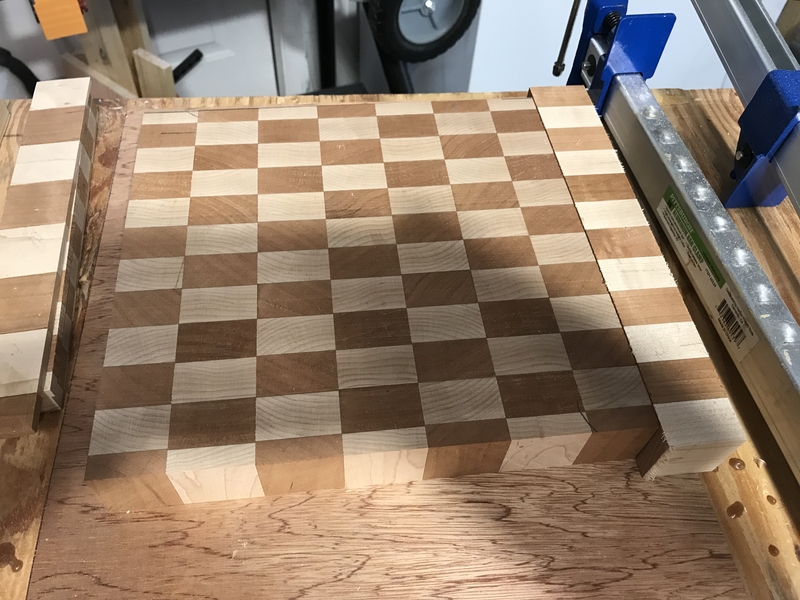 I made the grain go the wrong way. So I cut off the rockers and made new ones, and then braced it up against the existing cradle. 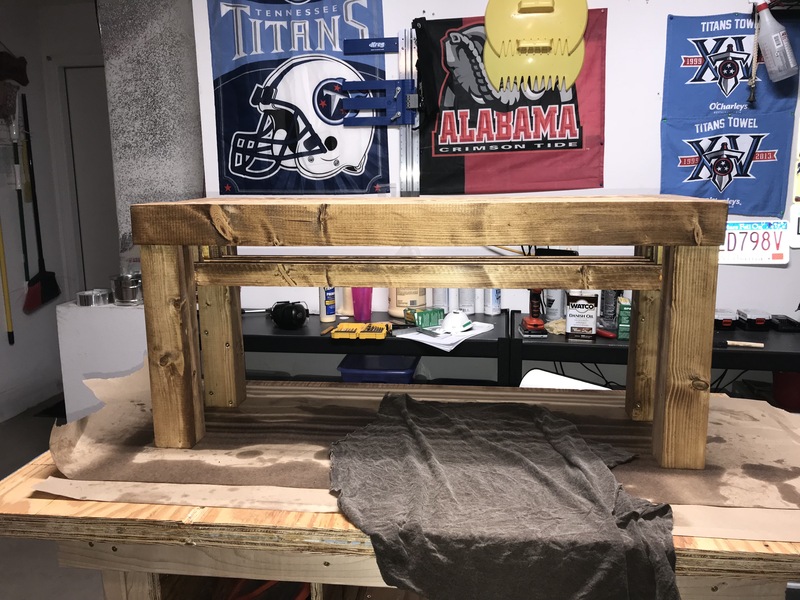 I recently completed my 8th (official) woodworking project of the year. 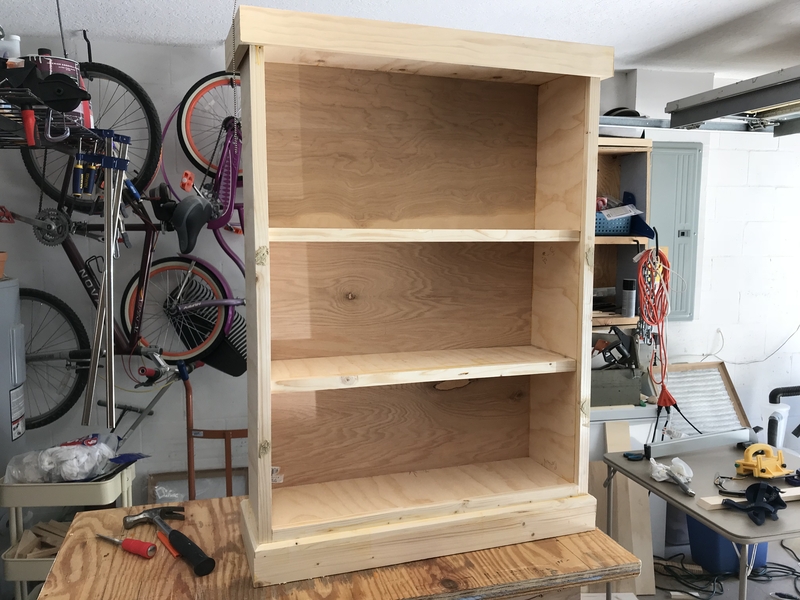 It’s a simple bookshelf, that ended up taking quite a long time due to sickness, stress, and stupidity. 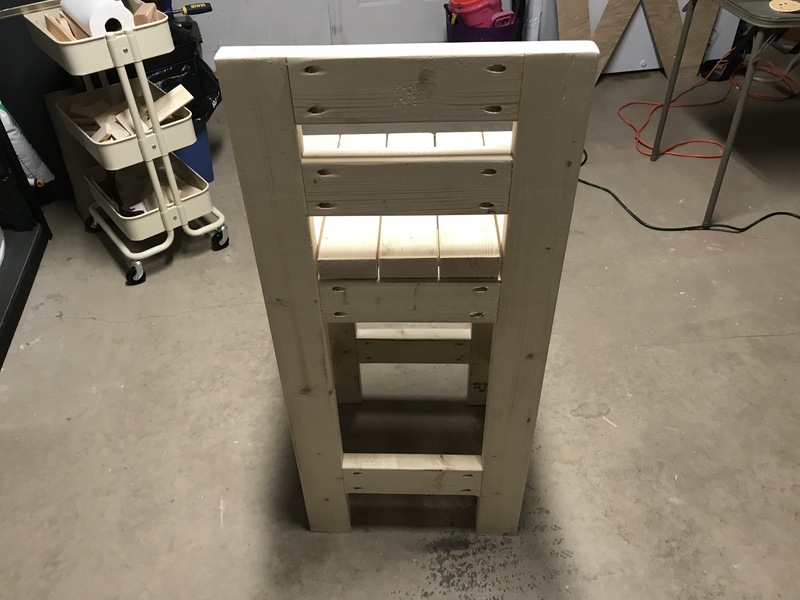 The shelf is the second to last project in the Weekend Woodworker course by Steve Ramsey. I had a few issues with this simple build, mostly because I didn’t pay attention to some of the instructions. 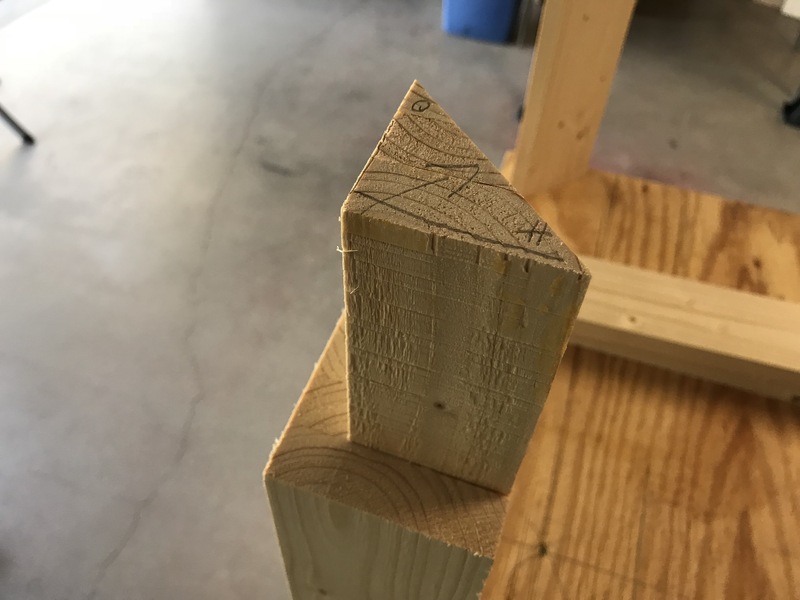 However, I’m learning that woodworkers aren’t supposed to disclose mistakes, because most people would never see them unless they’re pointed out! 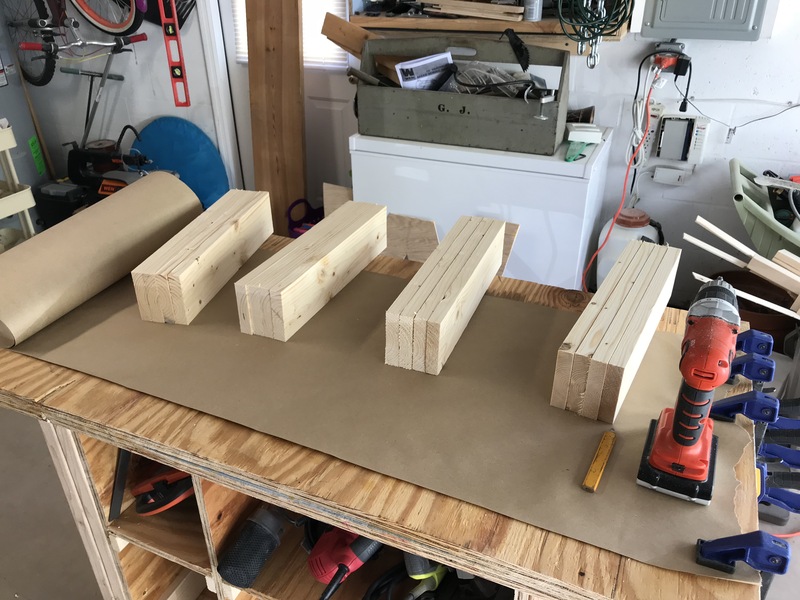 Starting out with some simple cuts. 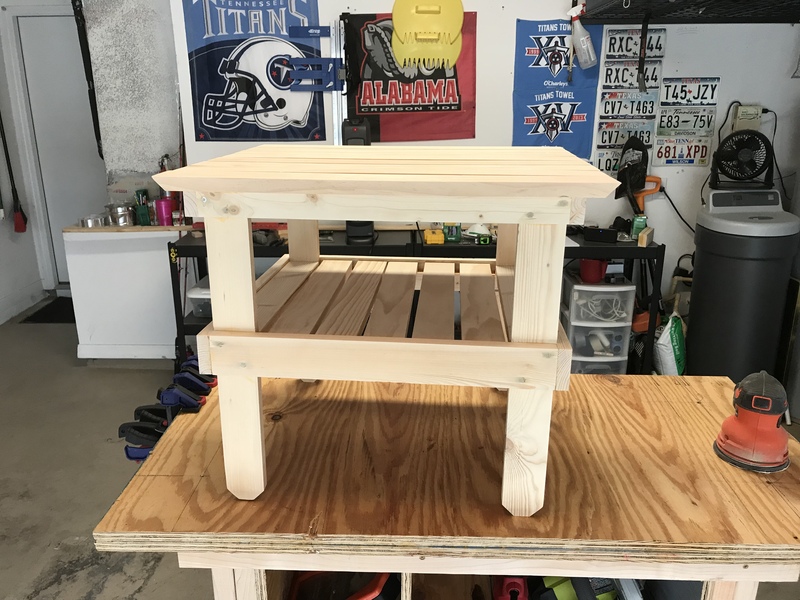 I started by assembling the base. 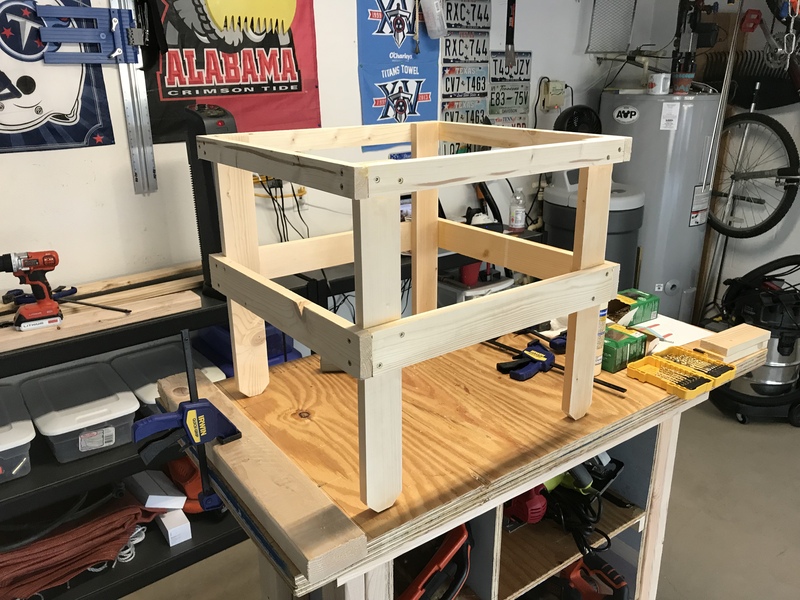 The base was mitered, and then put some brace pieces on for later in the project. 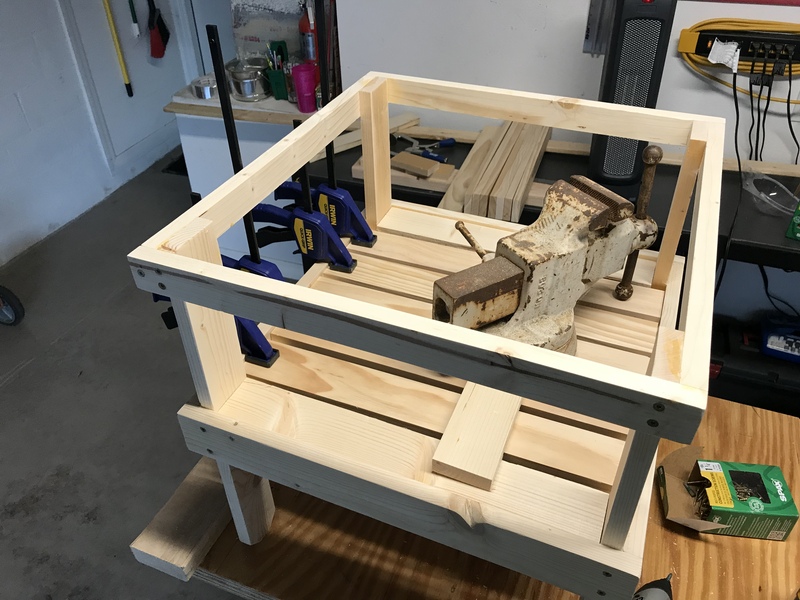 The base, almost fully assembled. I attached 2 more brace pieces before I was done. This is the body, or the “carcass” of the bookshelf. 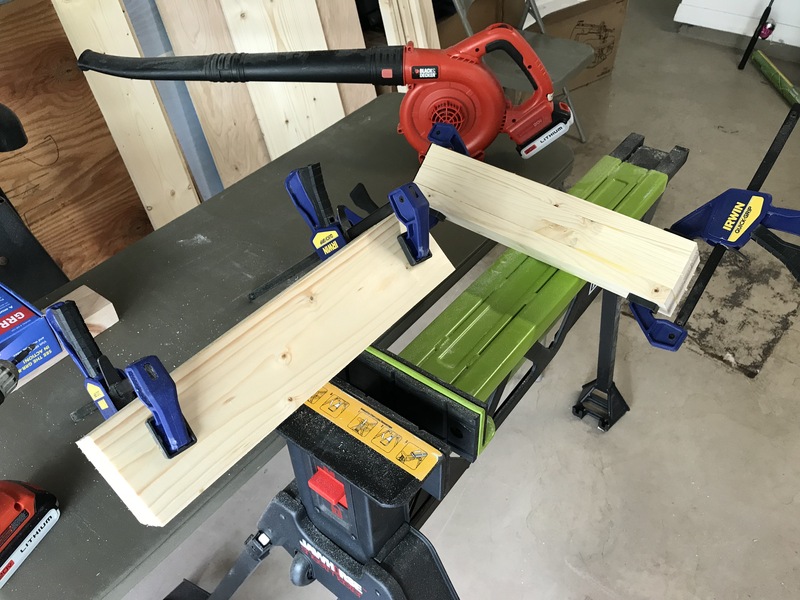 I have to say, I truly hate the strap clamps, but they work well. Whilst in the middle of the project, my old Black and Decker drill finally bit the dust. Part of the reason this project took a while was because I had to decide what to replace it with. 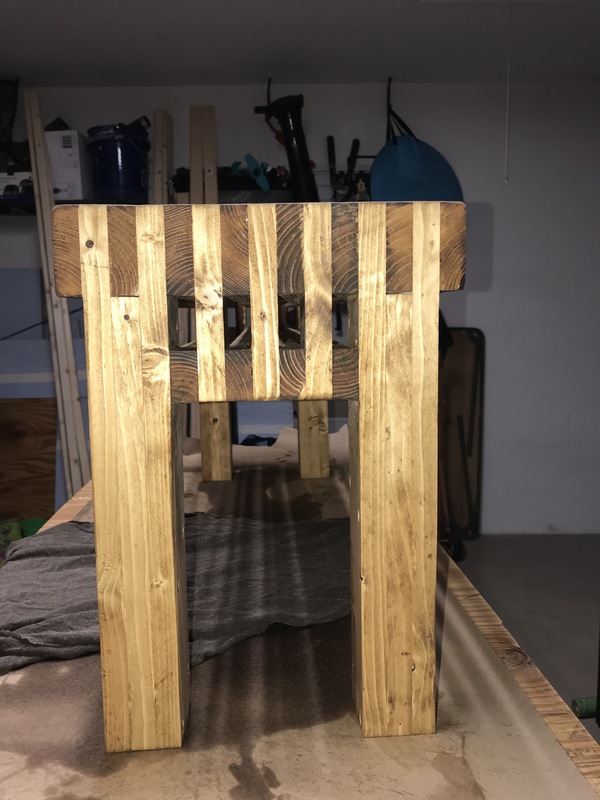 My wife decided it was time to stain one of the bar stools I made for our kitchen. Isn’t she a beauty? I had to cut dadoes or rabbets or whatever these are. Got a bit sloppy with the glue. The carcass is done. 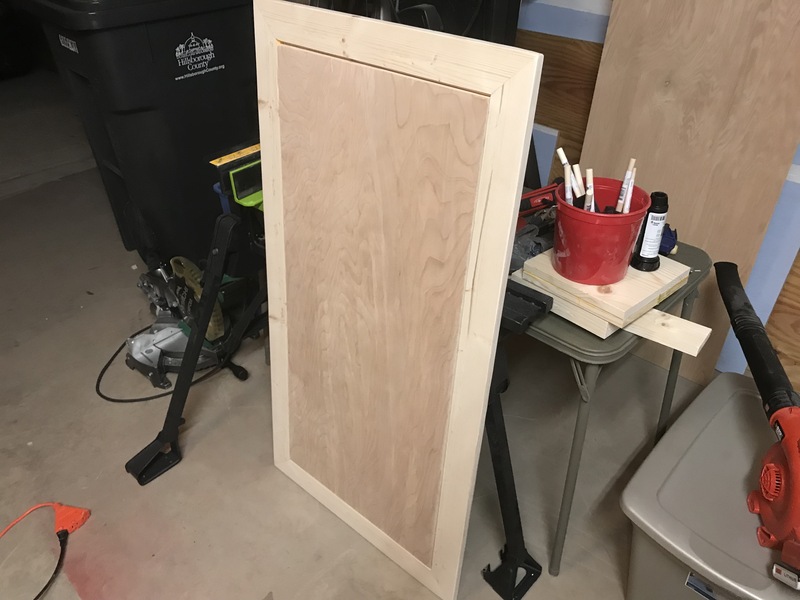 I was supposed to use one sheet of 1/4 inch plywood for the back, but I used two pieces I had left over. I’m going to paint this, and there will be a shelf covering the crack, so it won’t matter. My clamp collection is growing, out of necessity. 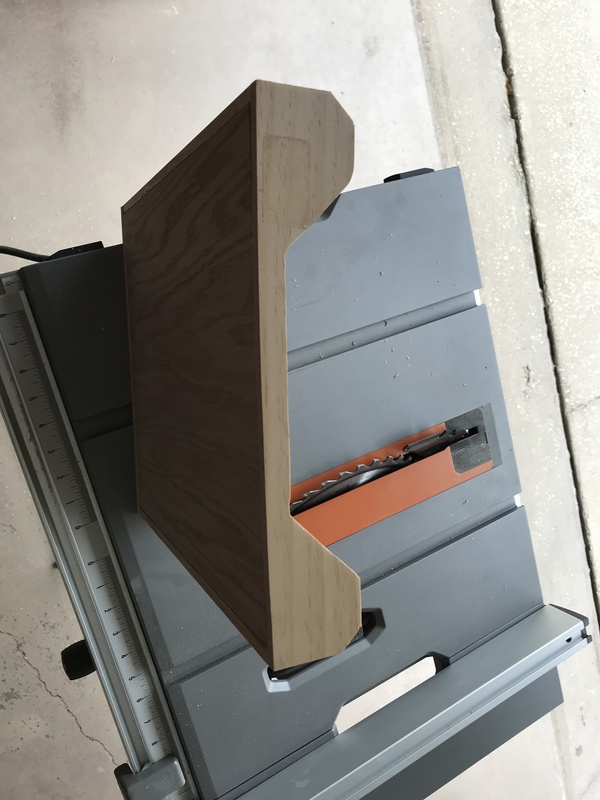 This shelf has decorative trim pieces on the front. These gave me more trouble than I thought, because I didn’t quite measure correctly. I ended up popping a few screws in to the decorative pieces. I went back and covered them with wood filler. Behold, the final project. The top has a decorative wrap around it. 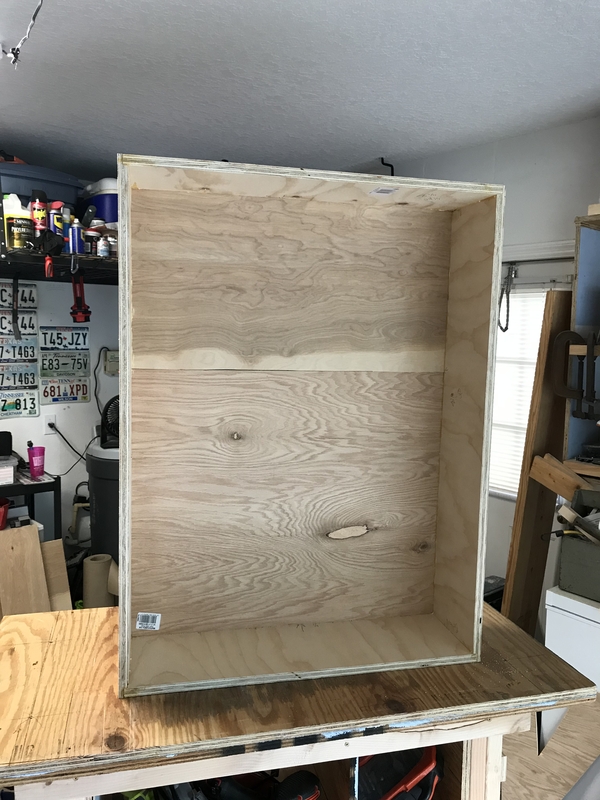 We haven’t painted it yet, but when I do, we’ll share an update! 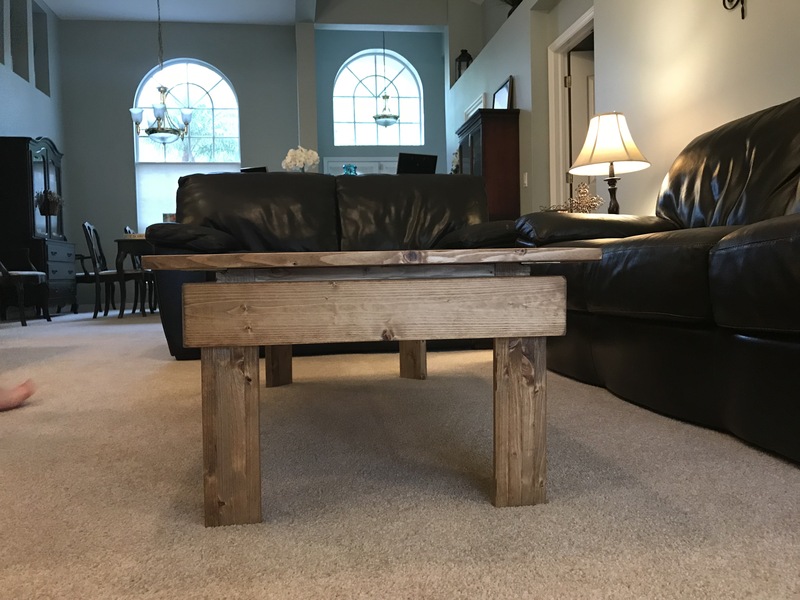 Again, special thanks to Steve Ramsey’s Weekend Woodworker course. It’s taught me a lot – and I still have one project left to go, which I am currently working on. It’s been so much fun. 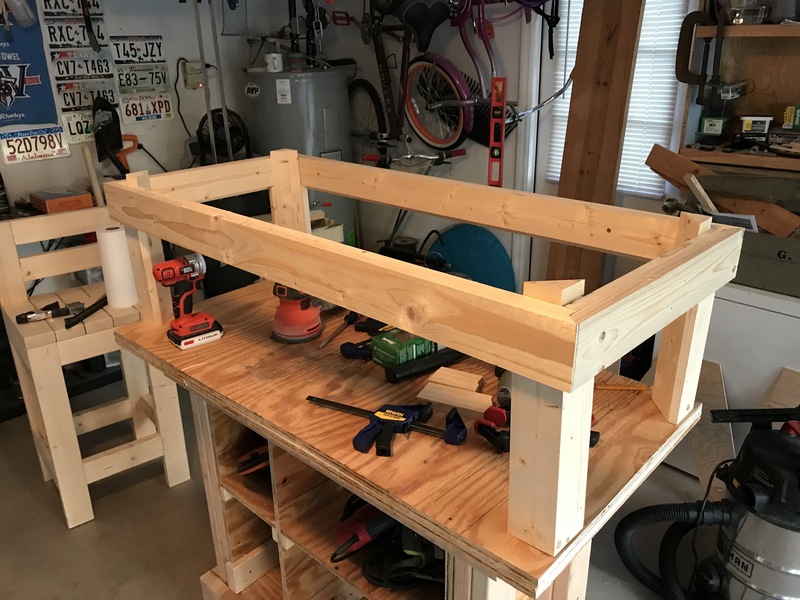 My first woodworking project ever was my daughter’s bed. 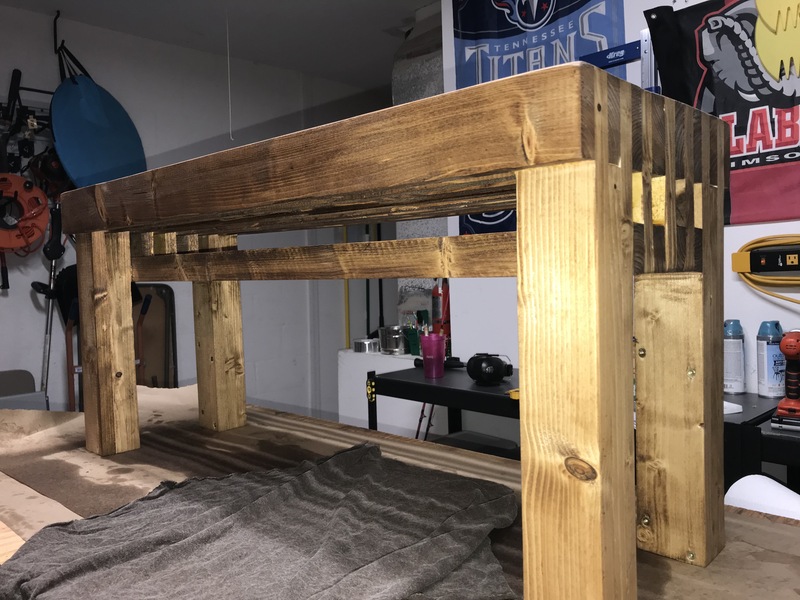 I built her a loft bed this past summer that you can read about HERE. One of the problems in our home is that the secondary bedrooms are small. Most newer Florida homes seem to have smaller secondary rooms. It just doesn’t leave a lot of room for extra things in our young daughter’s room. 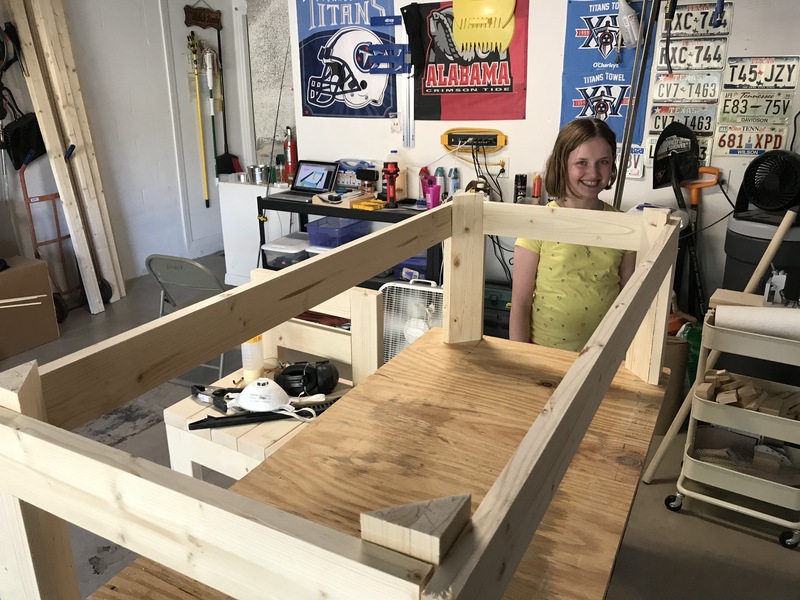 That’s why I built the loft bed in the first place – to get her bed up off the floor so she would have more room to play in her room. One of my next projects will be to add a desk under the bed. The one problem with the bed is that it was not easy to get in and out of. I had a ladder on the end that was built into the bed. 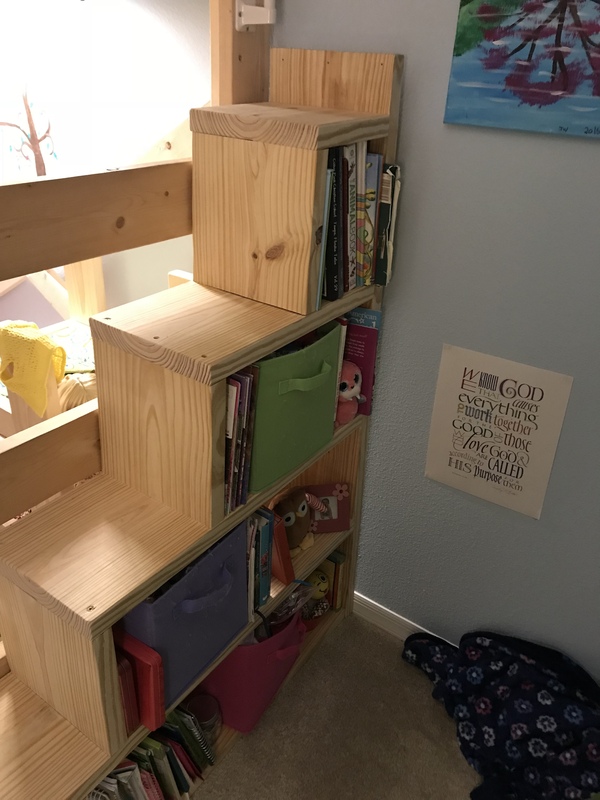 But I decided to kill two birds with one stone – add storage into the room, and make it easier for her to get in and out of her bed. 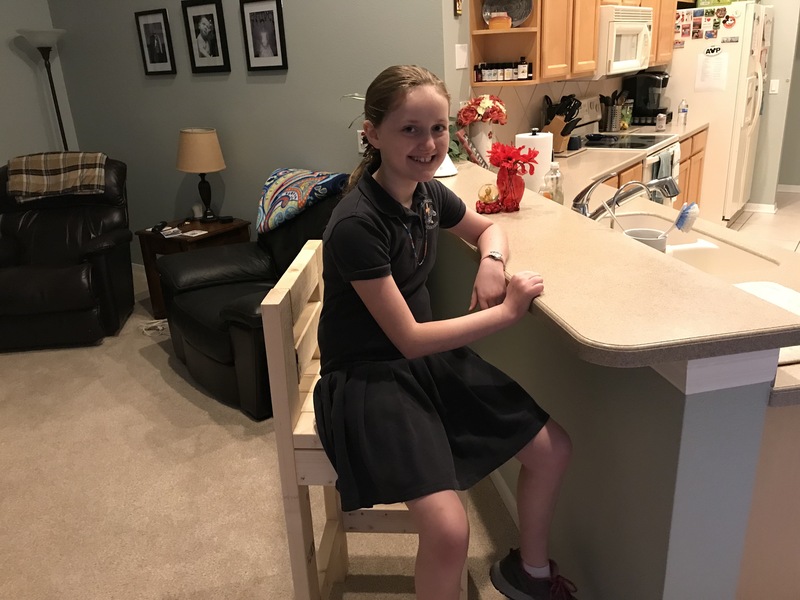 While this project was not overly complicated – and the design was very rudimentary – it has made her room and her life a lot easier. 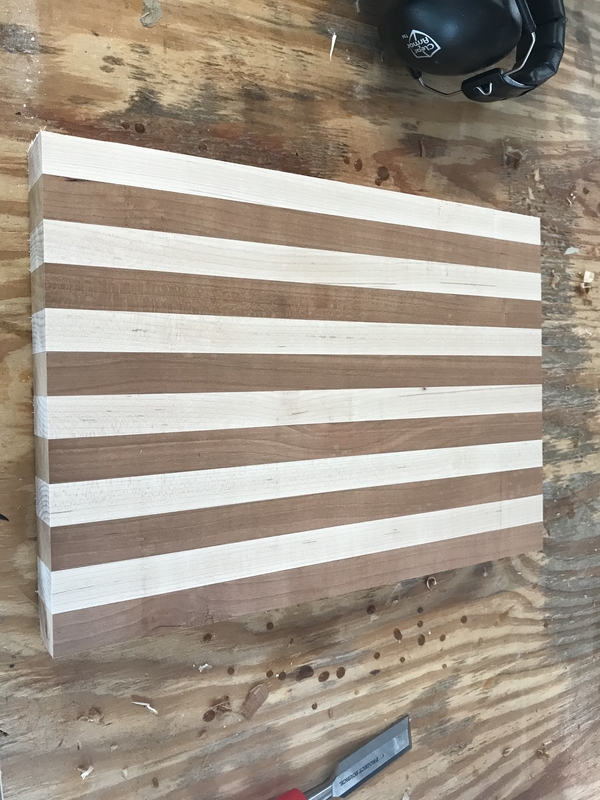 I started with some very thick, heavy, wide boards – some 2″ x 12″ boards. 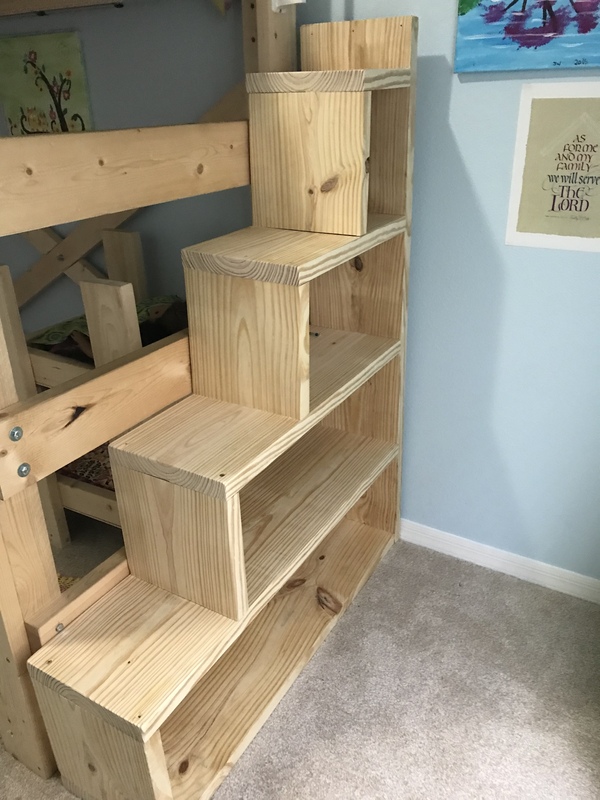 The idea – make shelves and stairs, without spending a lot of time and money. I started out with a crude design in my sketch book. 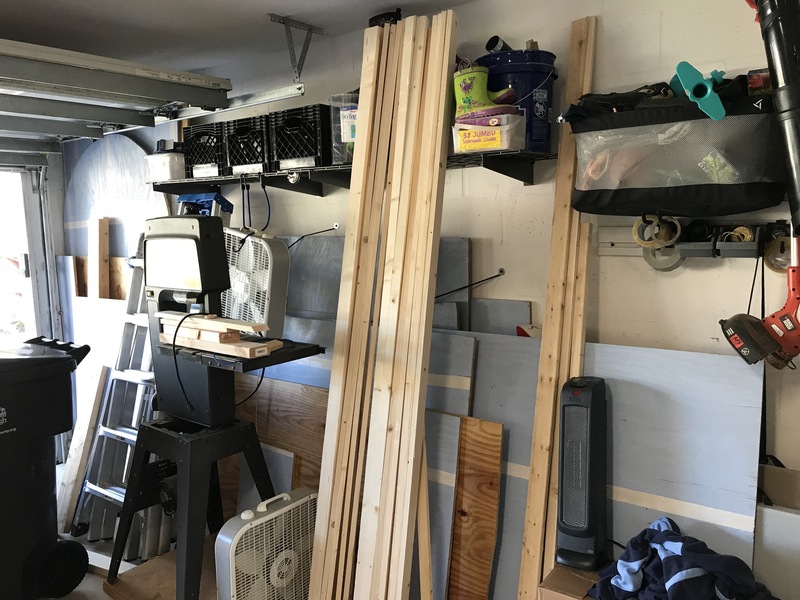 While it didn’t end up exactly like this, it helped a ton in figuring out how much wood I needed, and how big the shelves needed to be. 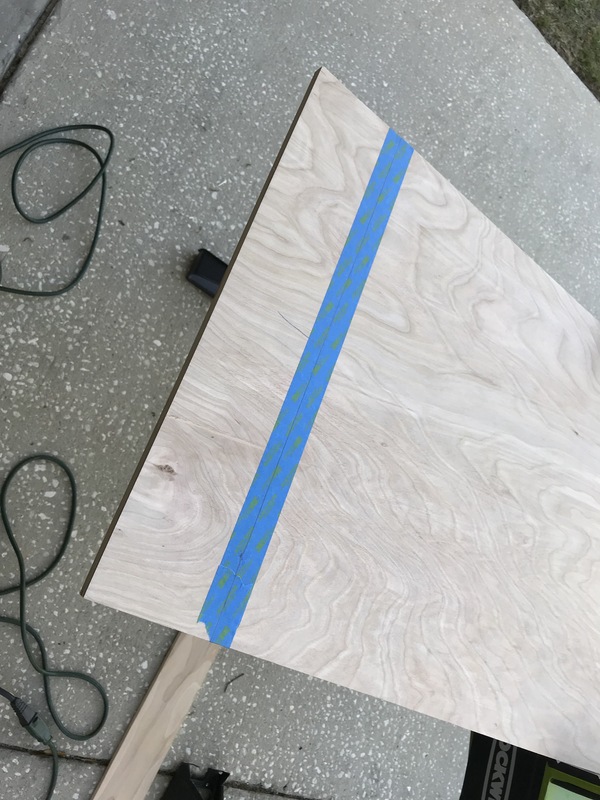 Measuring, marking, and cutting the first piece. 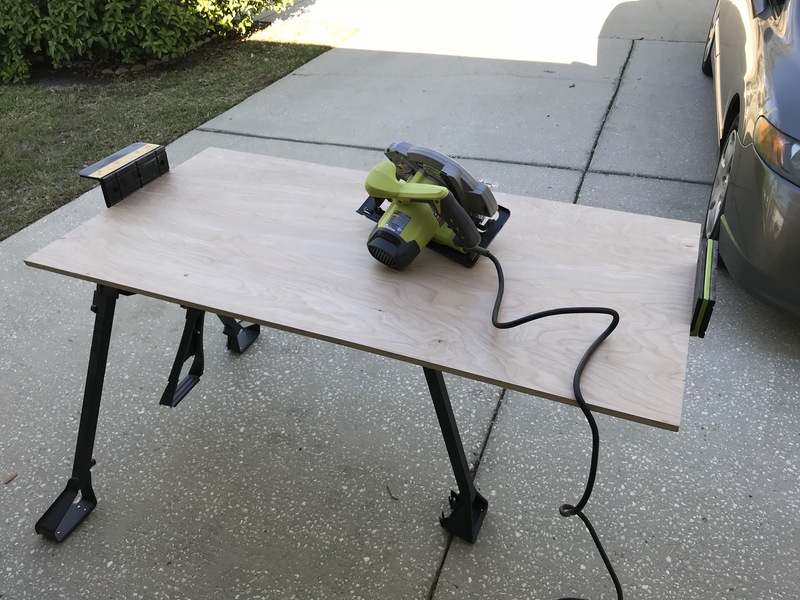 Using a circular saw, I was able to just set the depth and cut it right on my mobile work bench. 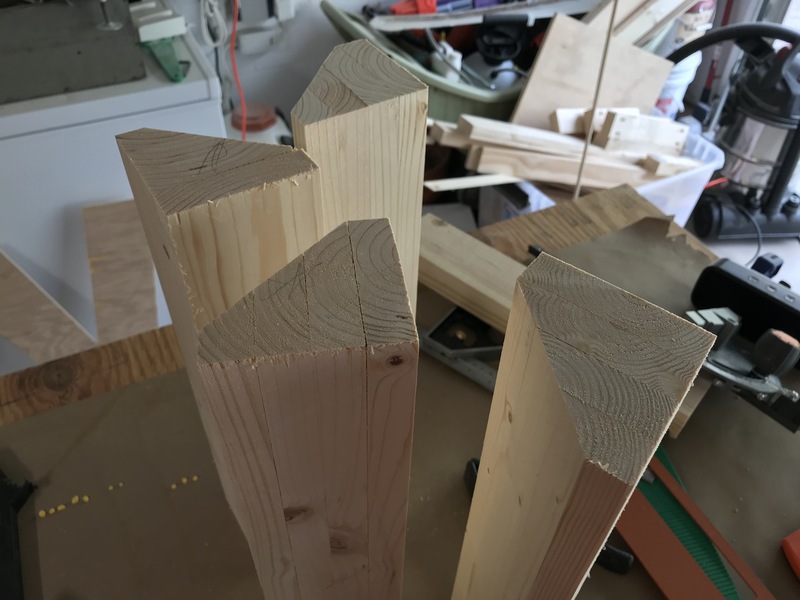 The cuts for the stairs/shelves. 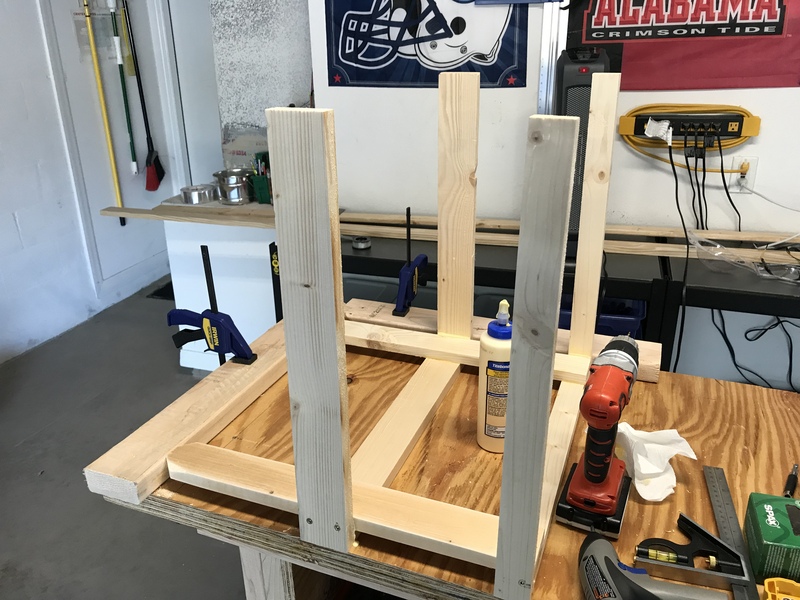 Using my Rockwell Jawhorse extension piece to balance the back part of the shelves so I can begin attaching the other pieces. Starting to come together. I’m not going to cover the screws, because in the original bed, I left everything exposed – plus – we’re going to paint it this summer. Placing the stairs by the bed. 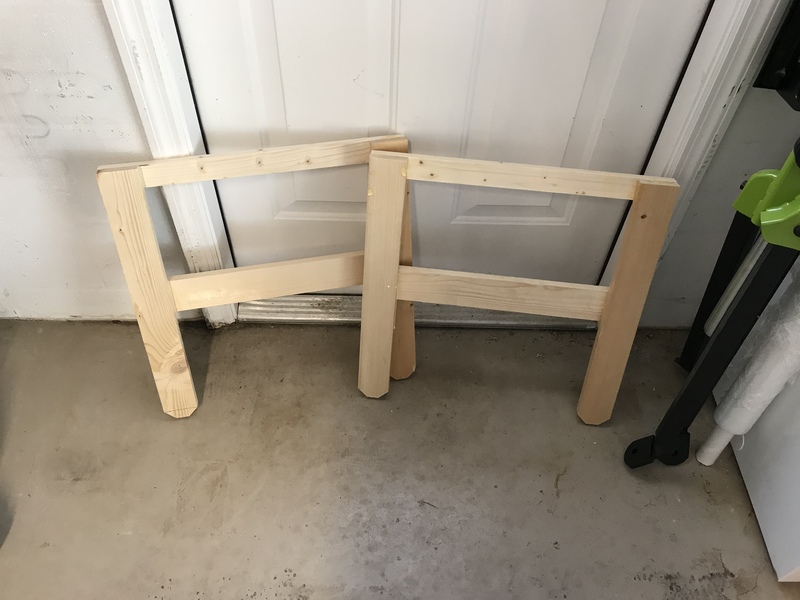 I attached them to the bed with some “L Brackets.” Very sturdy, and it’s not going anywhere. 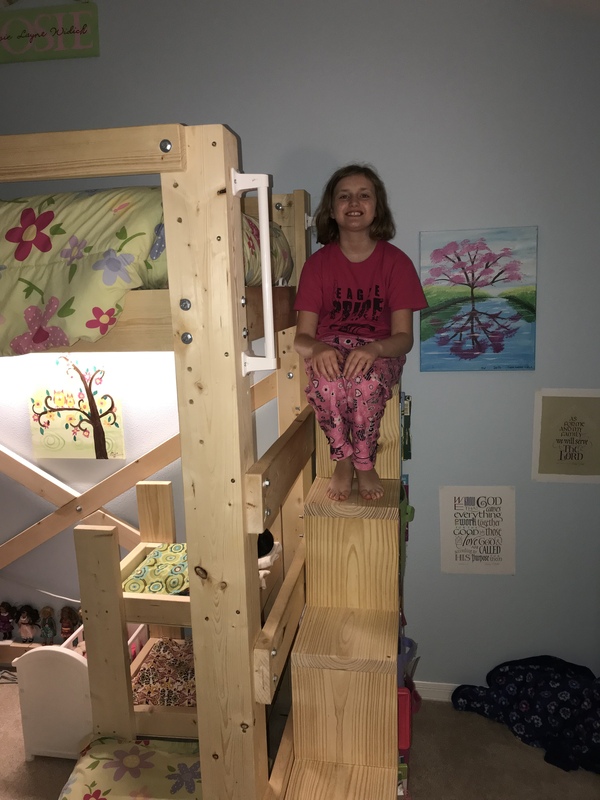 The loft bed had handles on it already for her to climb into it, so the height of the stairs went just under where those handles are. Josie started filling her shelves right away! She loves the stairs! It makes getting in and out of her bed so much easier!! You can also see in this picture the bunk bed I made for her American Girl Dolls. That’s where the desk will go eventually. 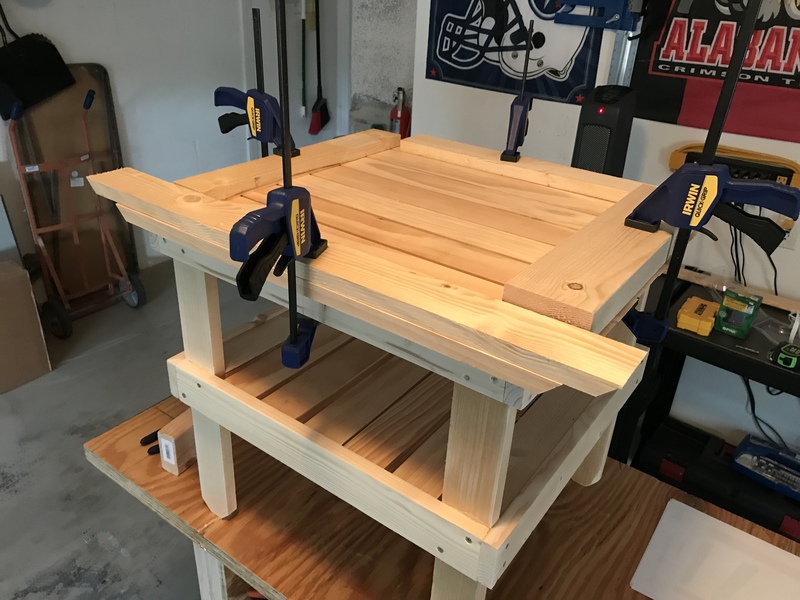 It’s been a few weeks since I’ve updated my woodworking projects. There’s been so much going on, but I finally got around to wrapping up my 6th project of the year. 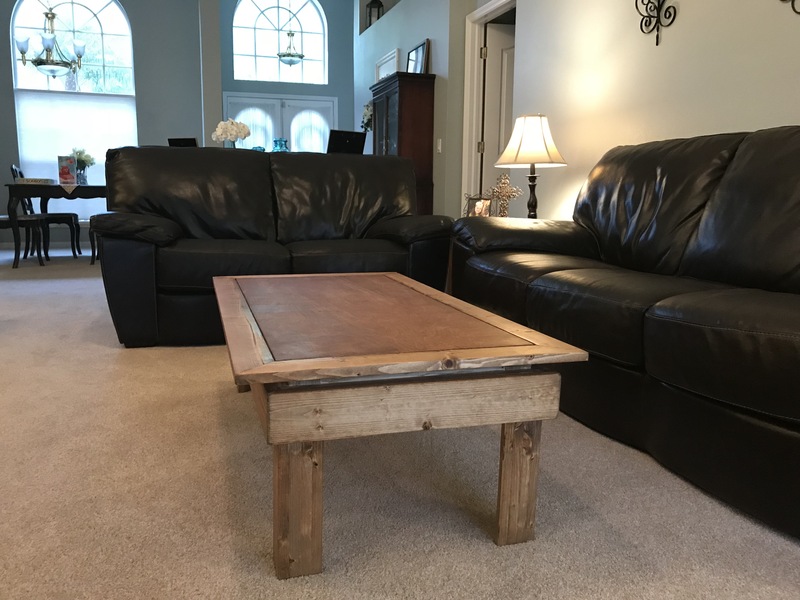 I’ve finally finished the coffee table for our formal living room. 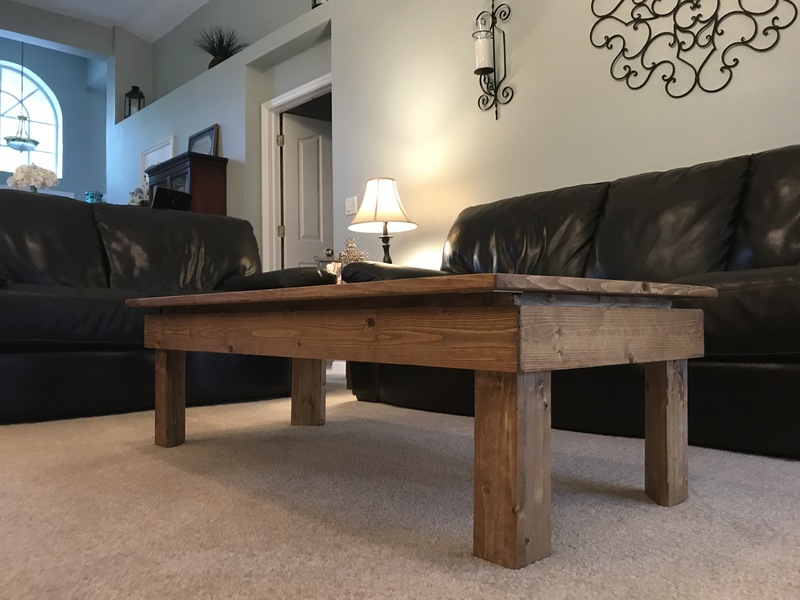 This project took longer for a few reasons – time constraints, evening meetings, and the table was challenging. In the end, it turned out pretty good in my opinion. 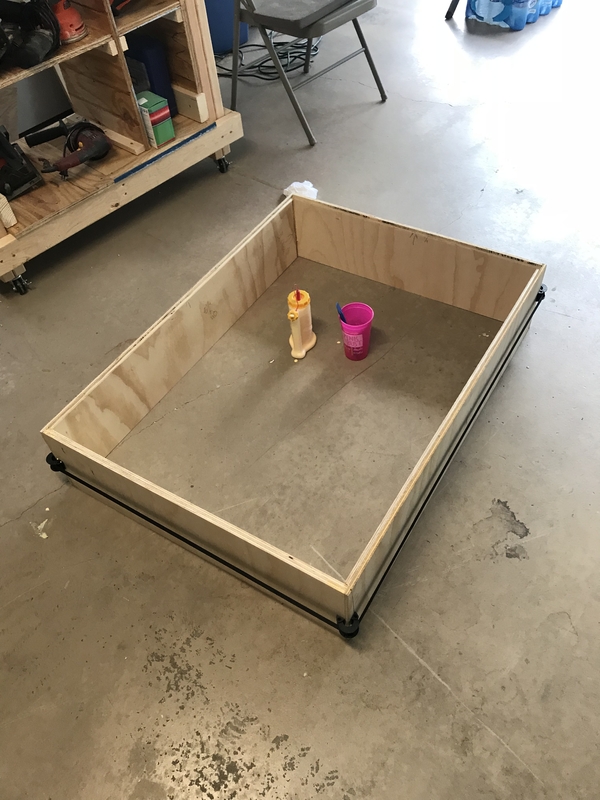 This table was built by 1x4s and a sheet of 1/2 inch plywood. 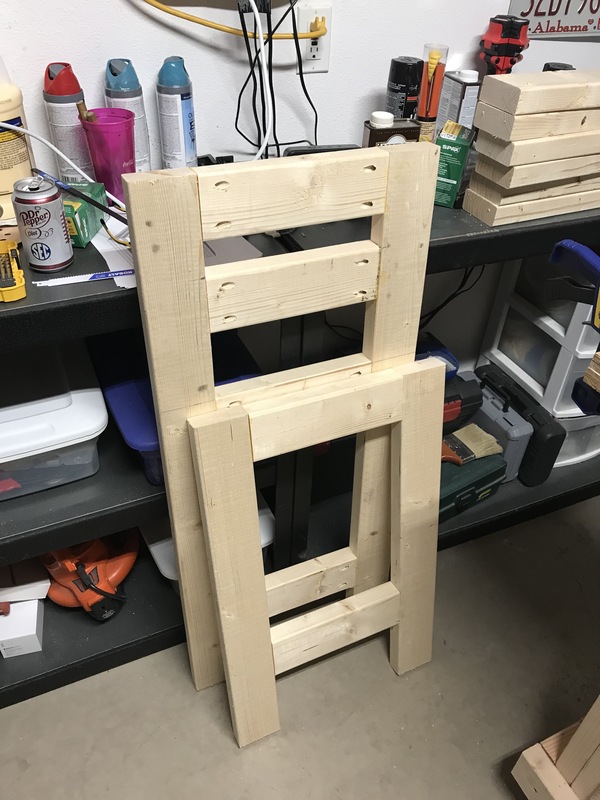 I also used a whole lot of wood glue! 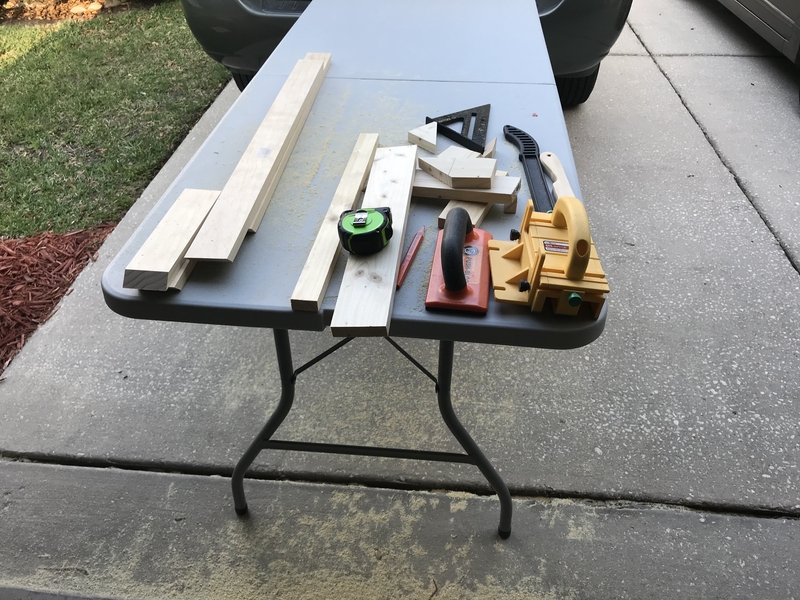 (not all of this wood was for the table…) This project was my first entry into the world of using dado blades, which look a lot more intimidating than they are. 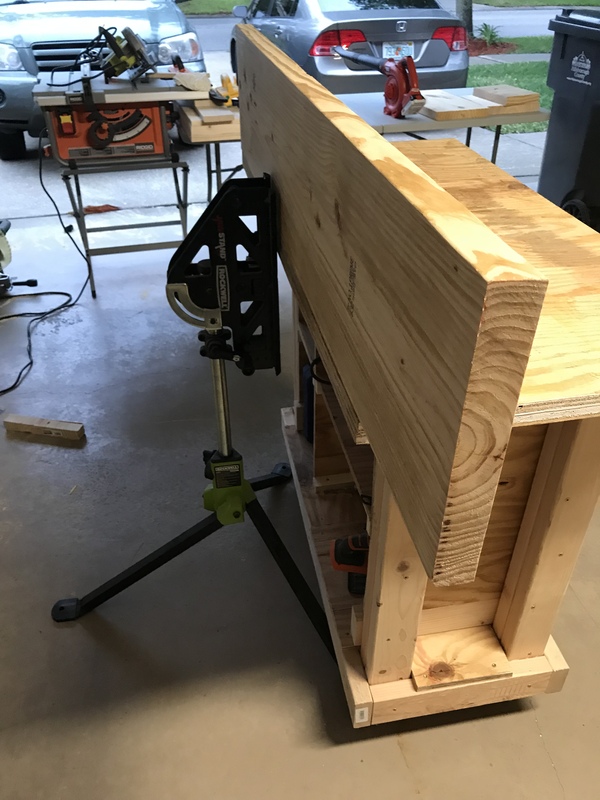 I also used a strap clamp, and made some pretty wicked miter joints. 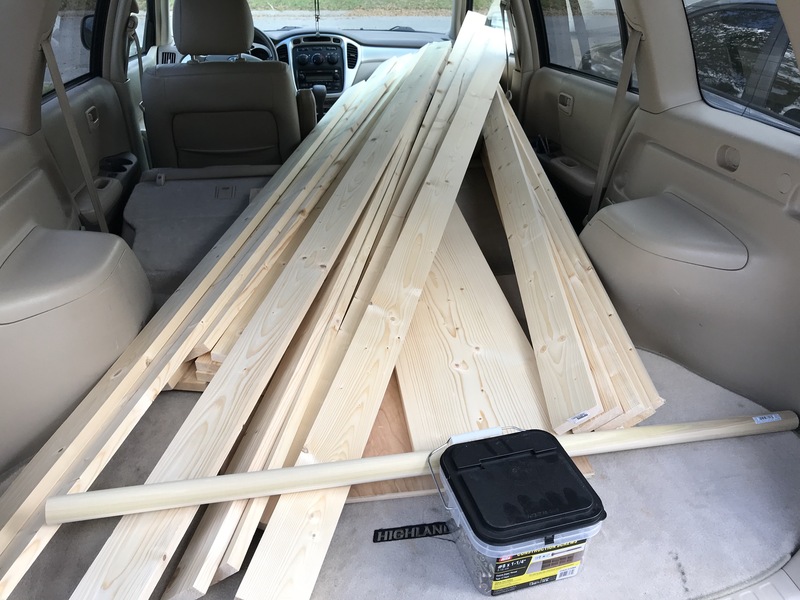 Lots of wood that I bought at a nearby big box home center. I started off by making the legs. This consisted of cutting them to length, and gluing them together. I then cut a bevel into them to put an nice looking angle to the legs. 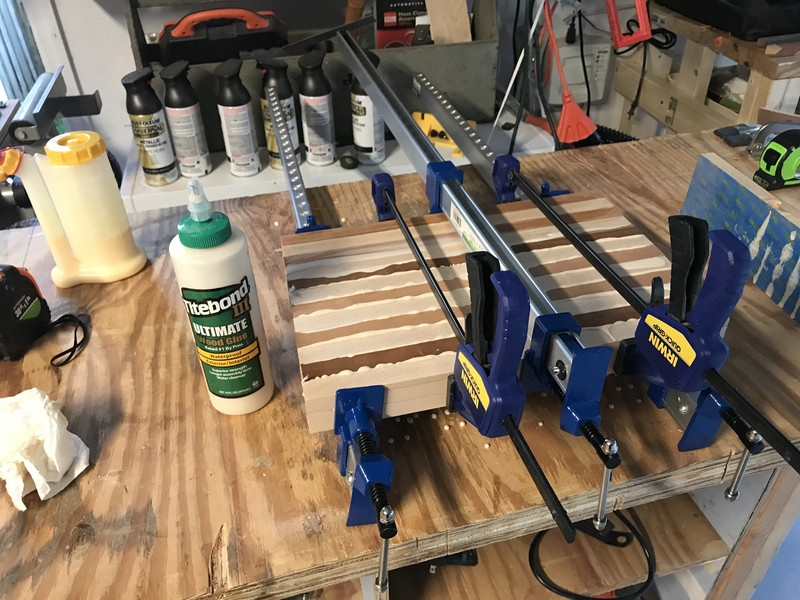 Gluing up the boards – since I don’t have a lot of clamps, I had to do two sets of legs together with my longer clamps. Two other sets of legs being glued up. All 4 legs glued up and ready to be shaped. 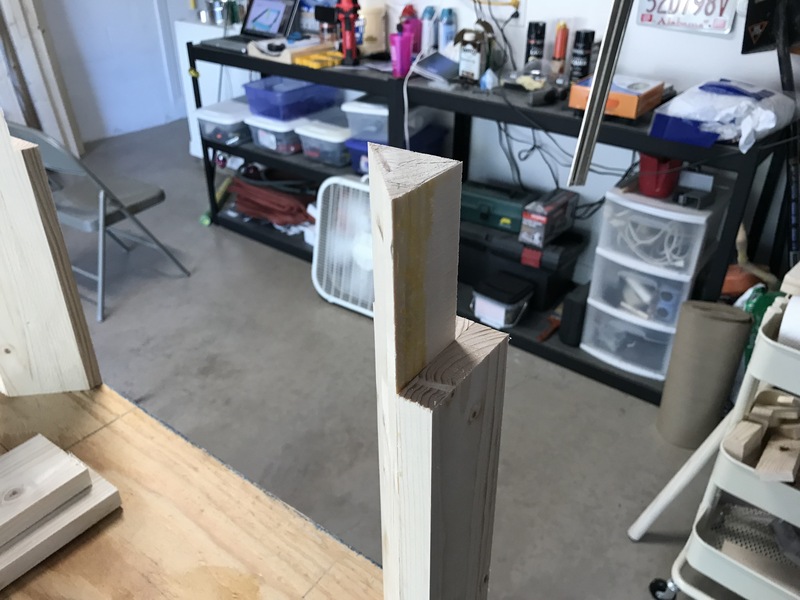 I ran the legs through the table saw at an angle to create an awesome looking bevel shape. 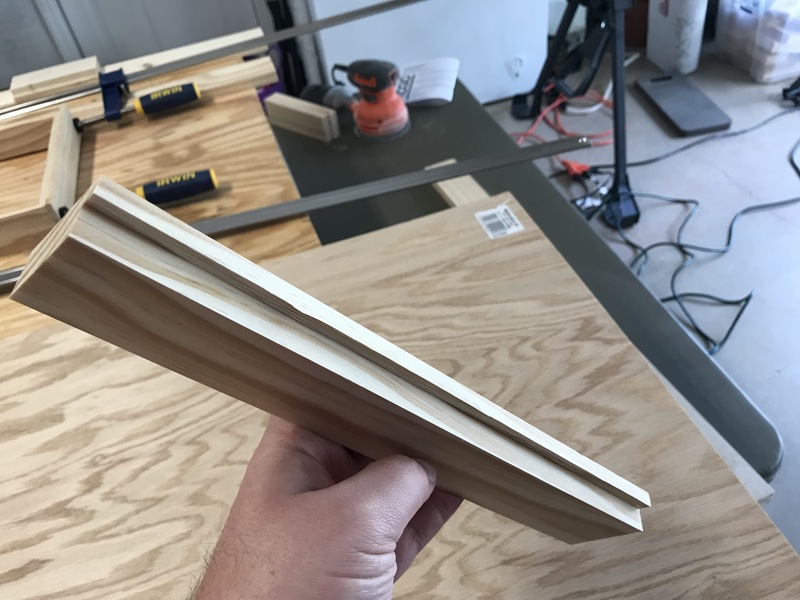 After that, I broke out my new dado blades. 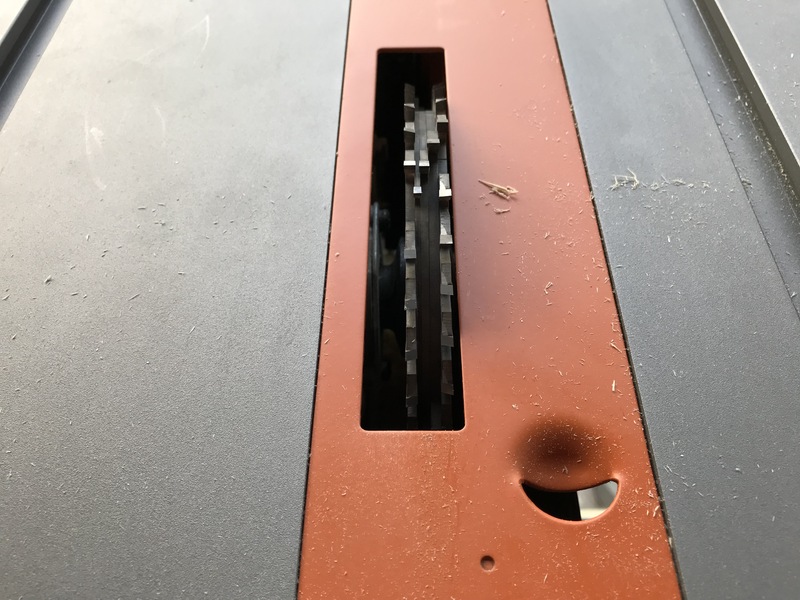 Dado blades help cut wide rabbets and dadoes much quicker than a regular saw blade. I used the dado blades here to cut a decorative top to the leg. Later on these will be where the frame goes. 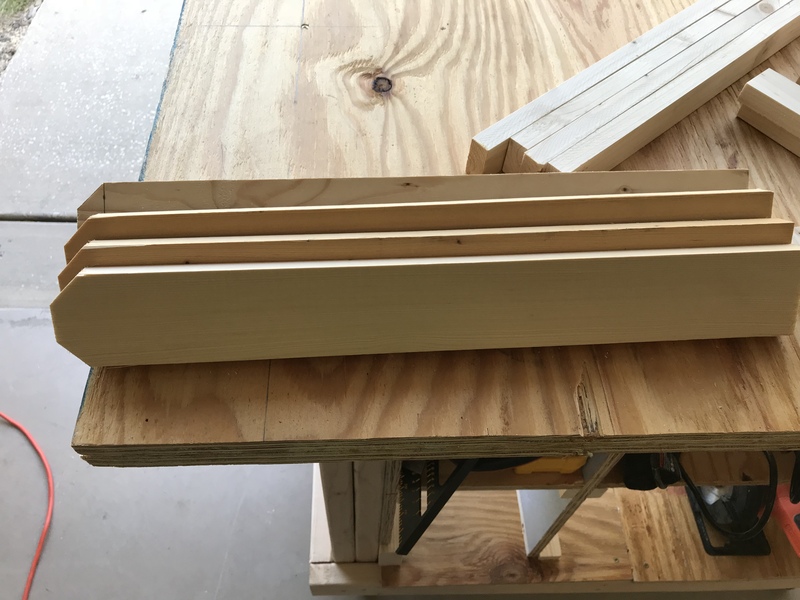 Dado blades made quick work of the next step, and aren’t that difficult to figure out. 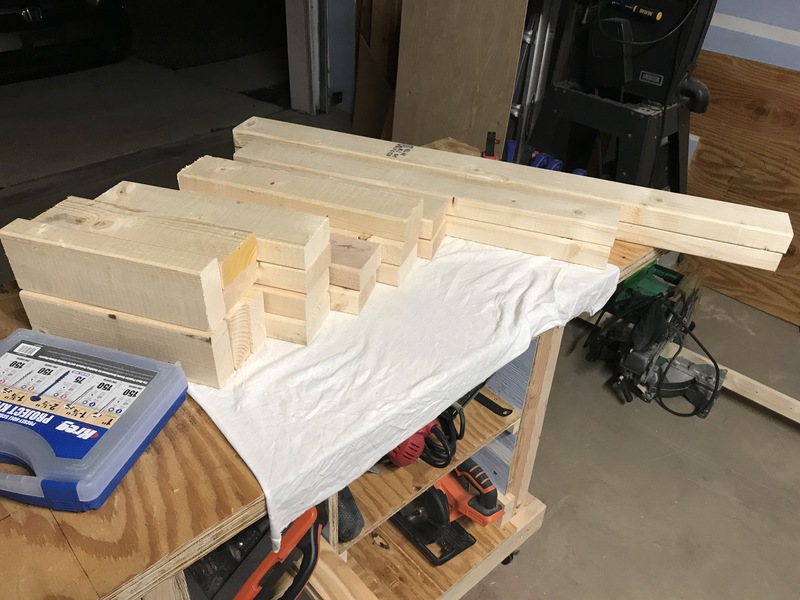 The stack I have is thicker, but don’t fit in the throat insert for my table saw. I need to make my own to use the whole stack. 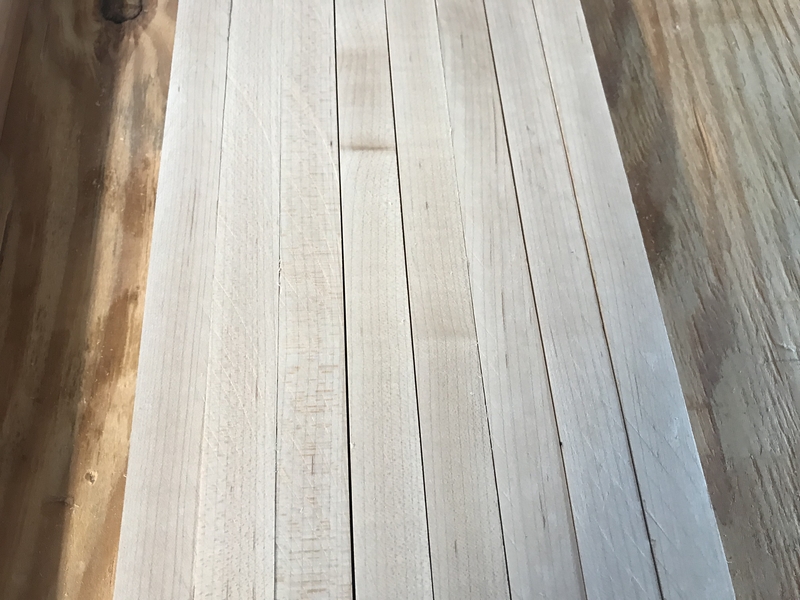 The result of the use of the dado blades. More of the shaping from the dado blades. 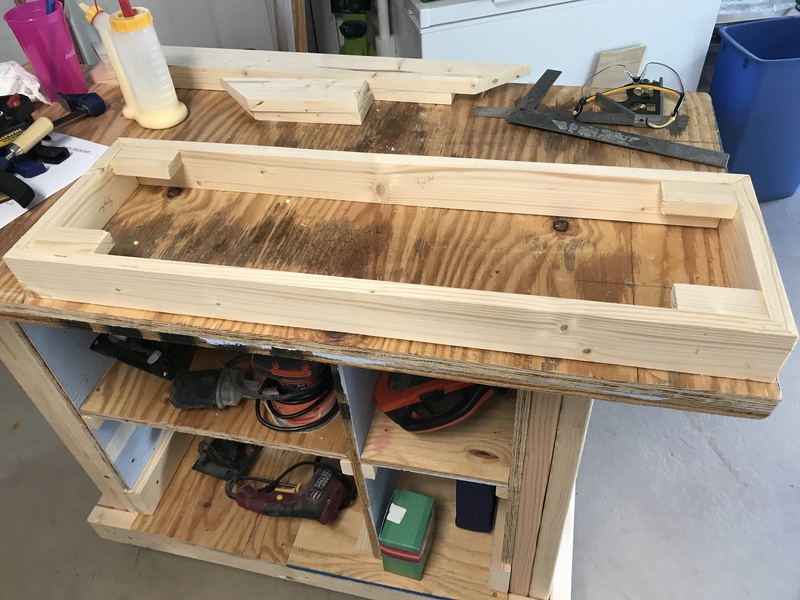 Next, I cut the frame pieces. 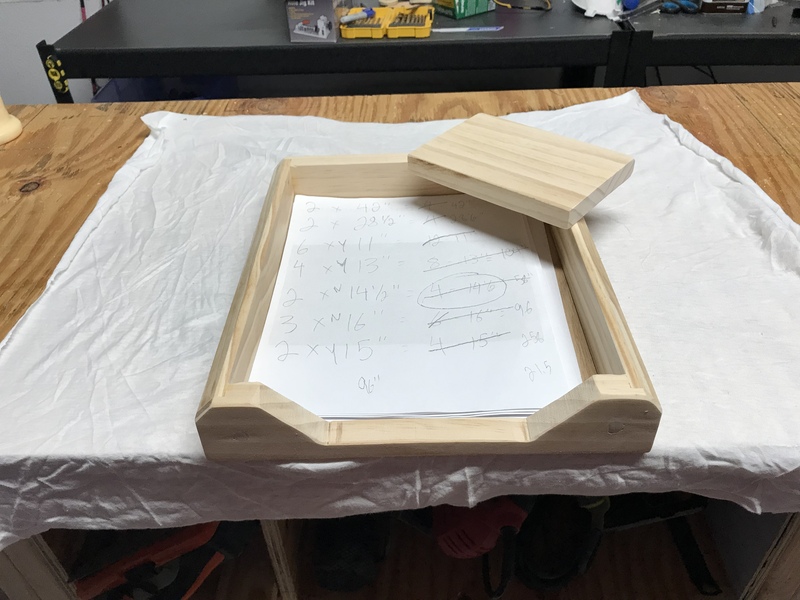 The plans I was using called for just a simple frame, but I wrapped them to have a mitered edge, which makes the table look more symmetrical. 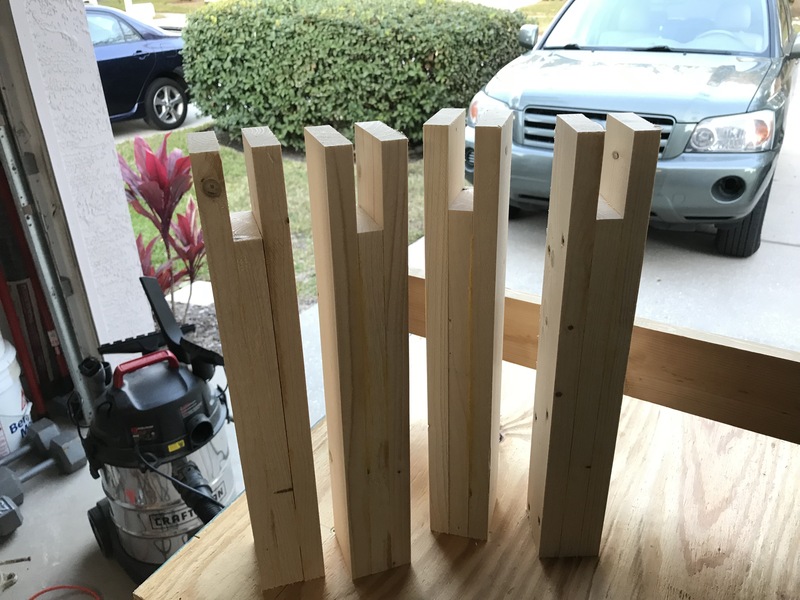 This part took me quite a bit of time, because I messed up one of the cuts, but I finally figured it out and got it put together. 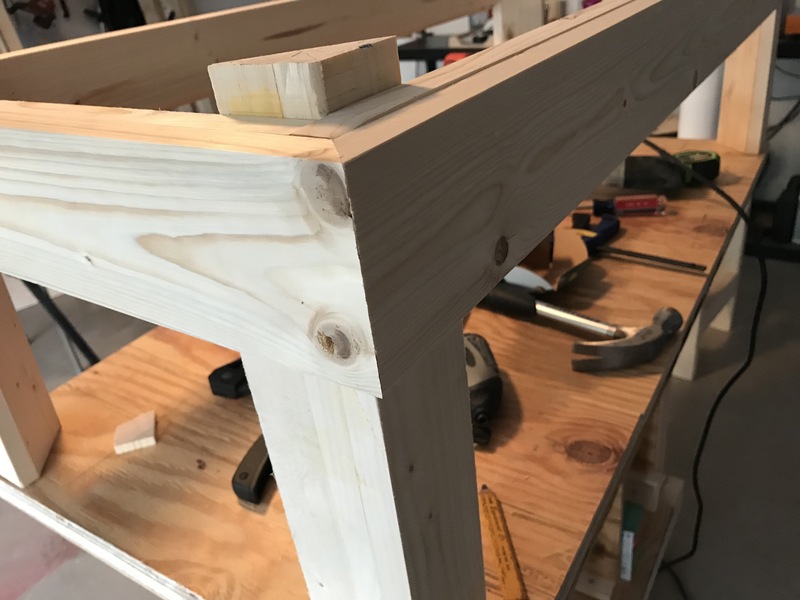 Putting the side frame pieces on to the legs. 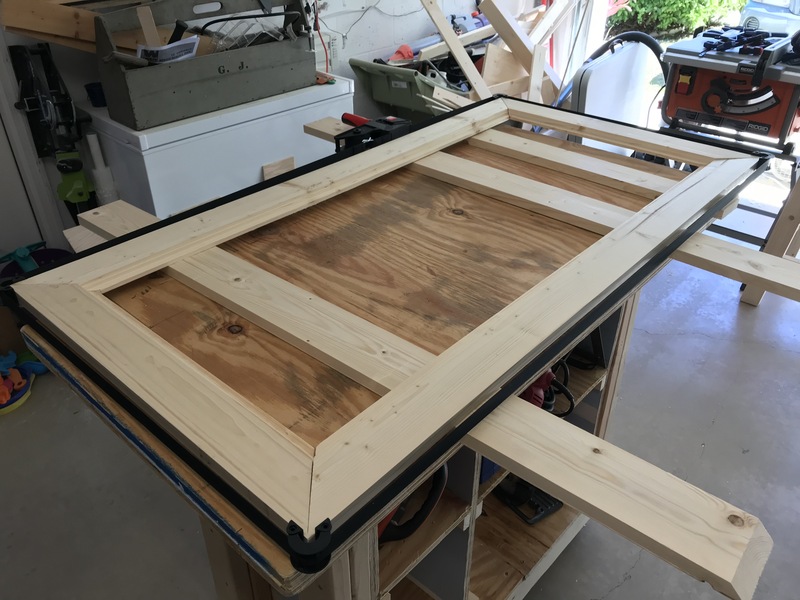 A dry run of the frame pieces. Cute daughter tax paid in this picture! 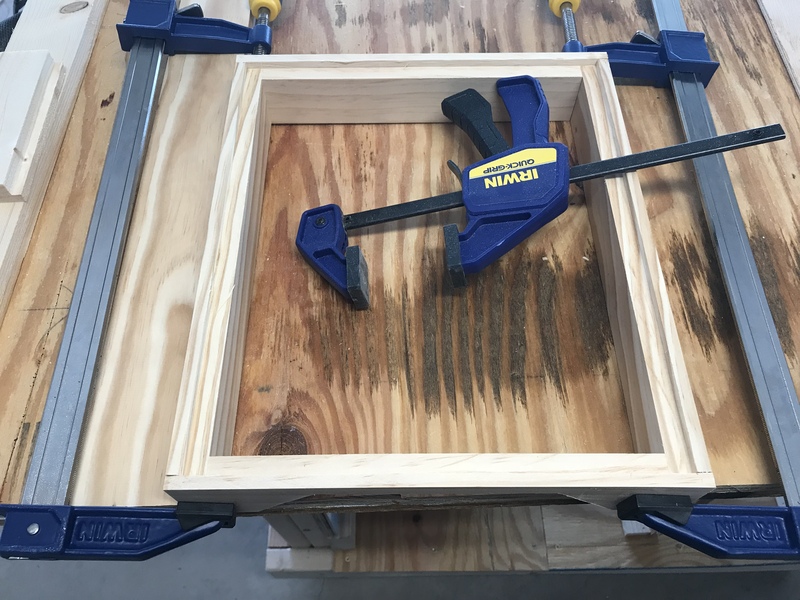 Adding a decorative wrap around the frame pieces. 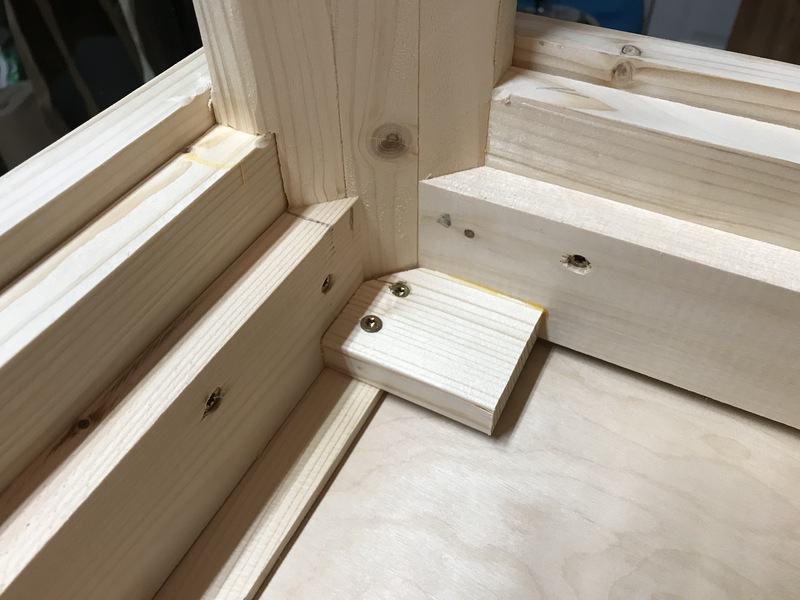 These pieces had mitered corners. 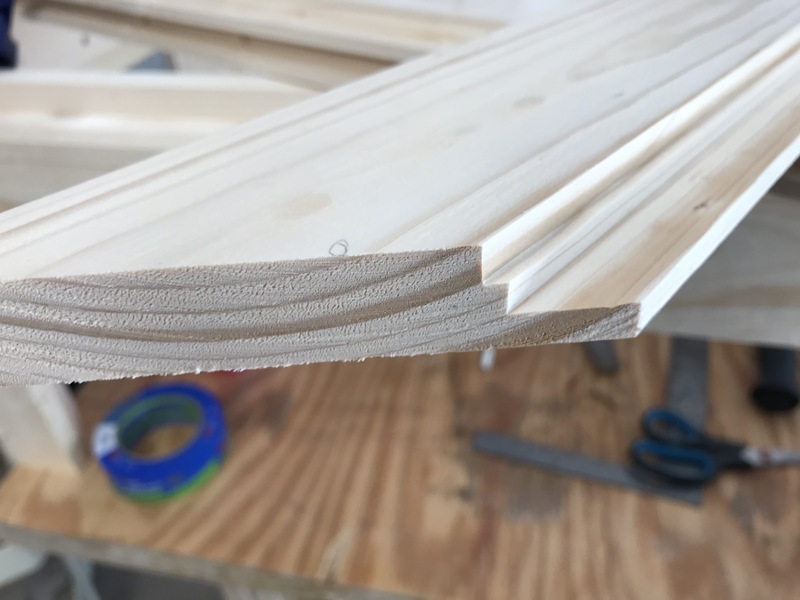 Check out the miters! In truth the inside frame pieces and the outside frame pieces weren’t necessary. But I messed up on the inside ones, and covered them up with the outside boards. Worked out well! Closer shot of the frame pieces. 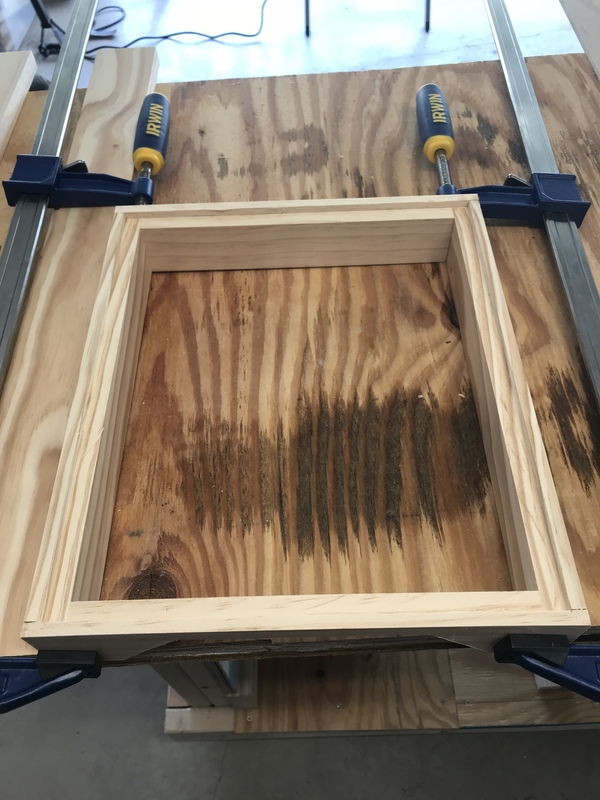 You’ll also see the shorter frame pieces connecting the spots cut out by the dados. 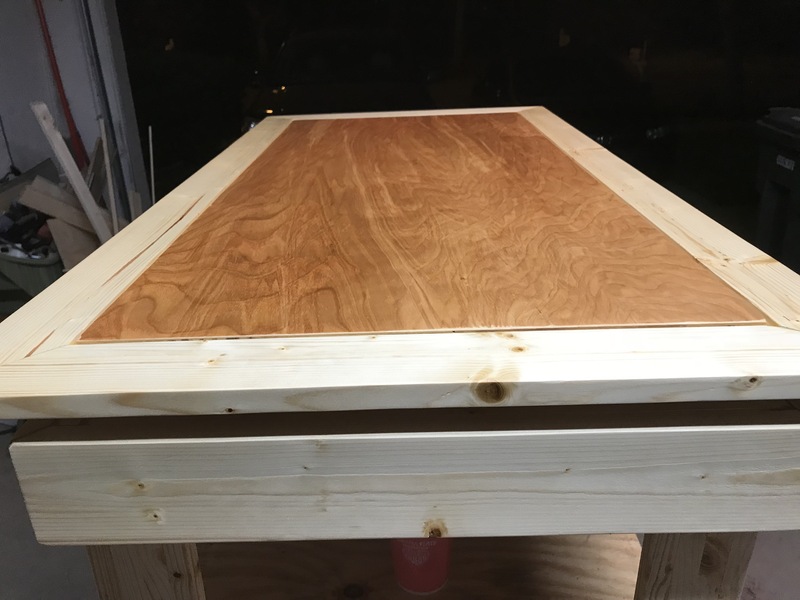 The bottom of the table, completely assembled. 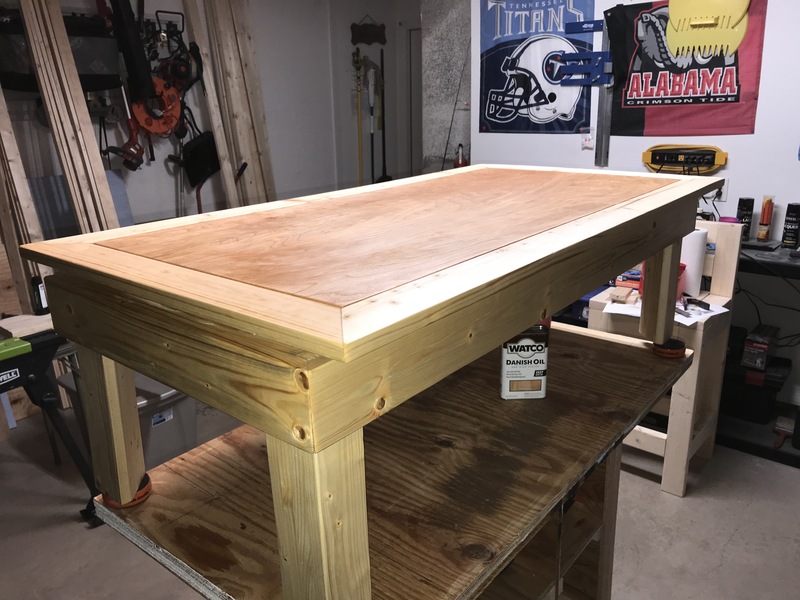 Heading into the final phase, I had to do the table top. 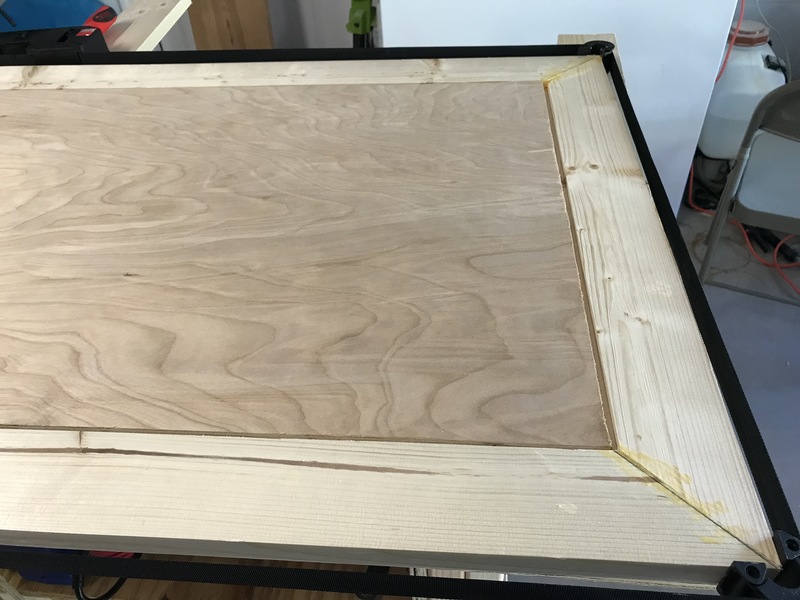 In essence, it’s a large picture frame with a sheet of 1/2″ birch plywood as the “picture.” I cut a large rabbet, and then added a shadow line to it, which is a neat feature that adds some depth to the piece. Using the strap clamp was not easy. I had a lot of frustration with it. But it did work well. 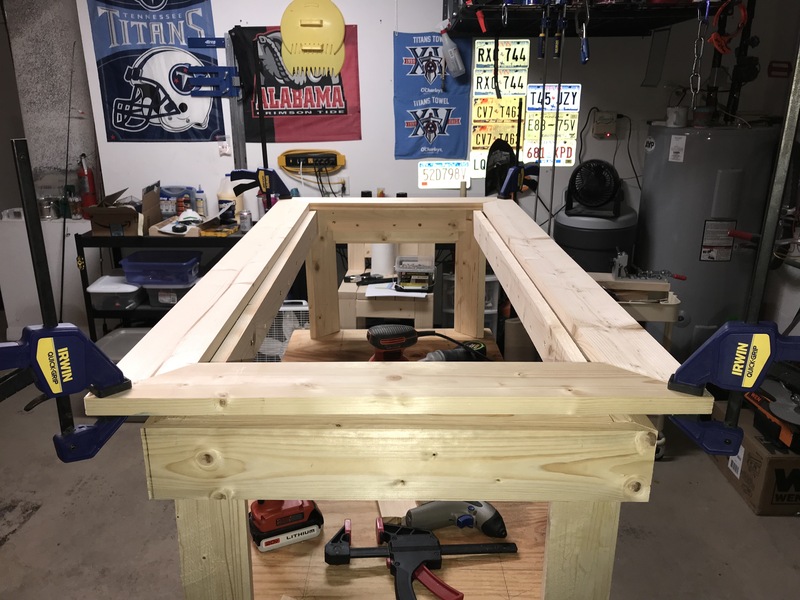 The frame for the top. 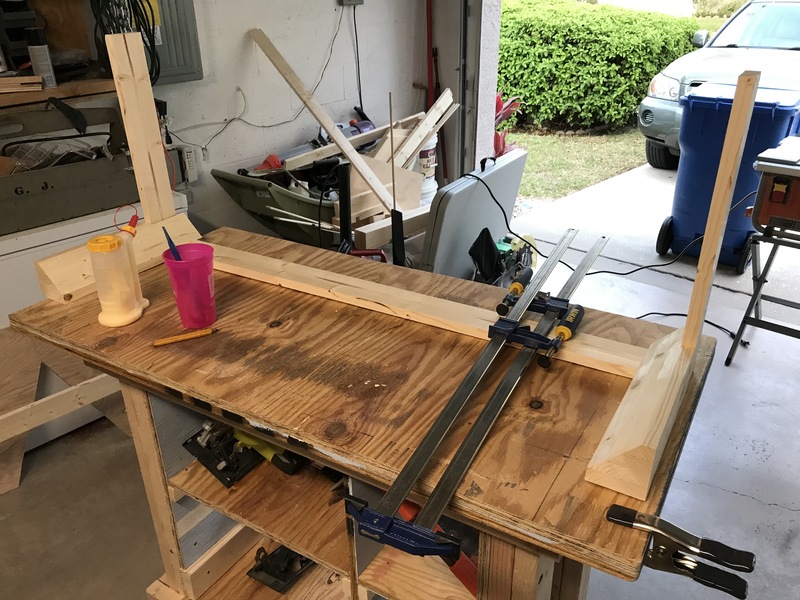 I did a dry run with the strap clamp before I glued it up. 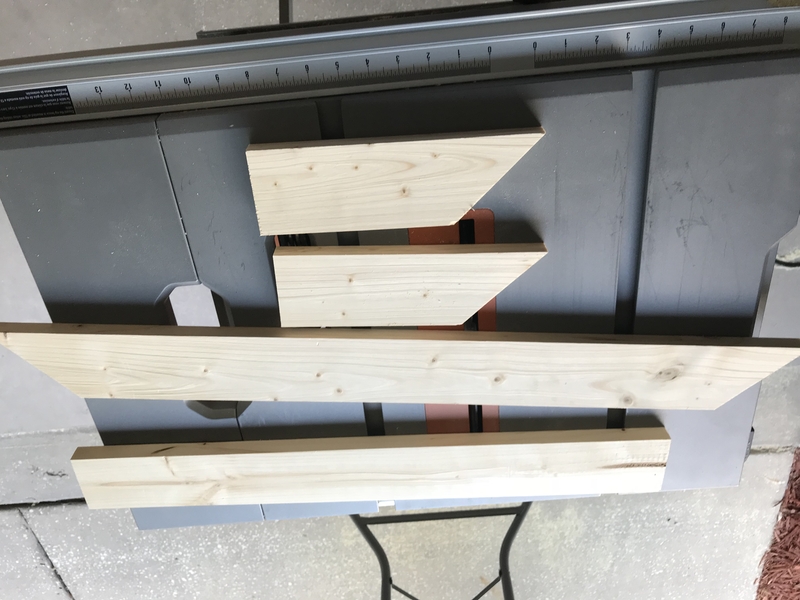 On all of the miter frame pieces, I cut a large rabbet for the table top to sit down in, and then the smaller rabbet is called a shadow line. 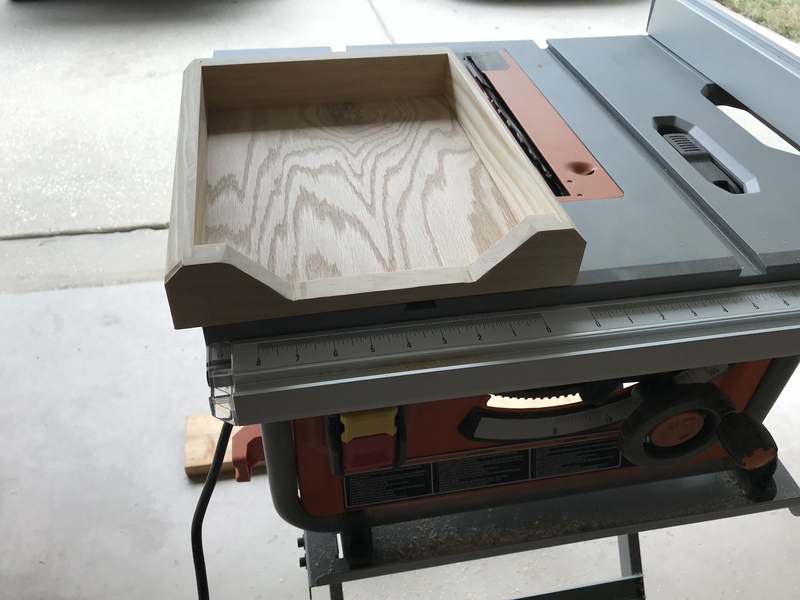 Trimming up the plywood for the insert. The tape is to minimize chipping. 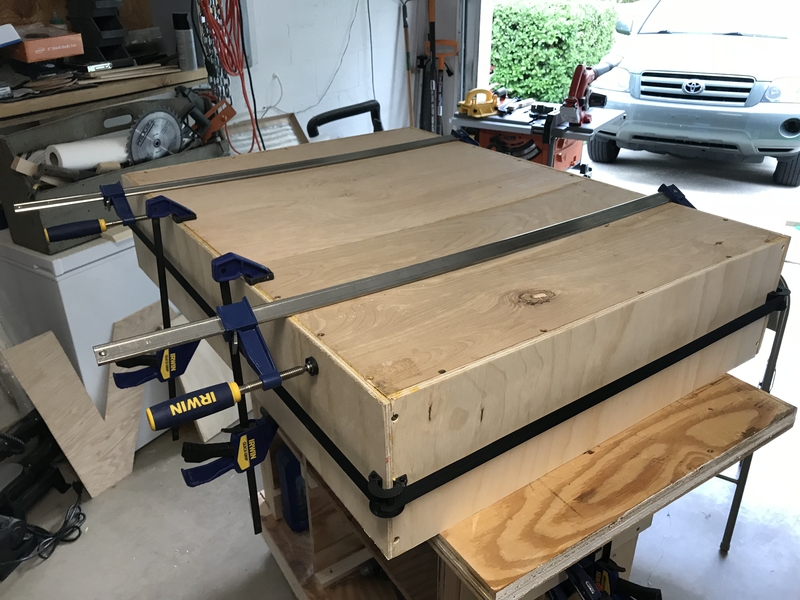 Using my Jawhorse for the cut. 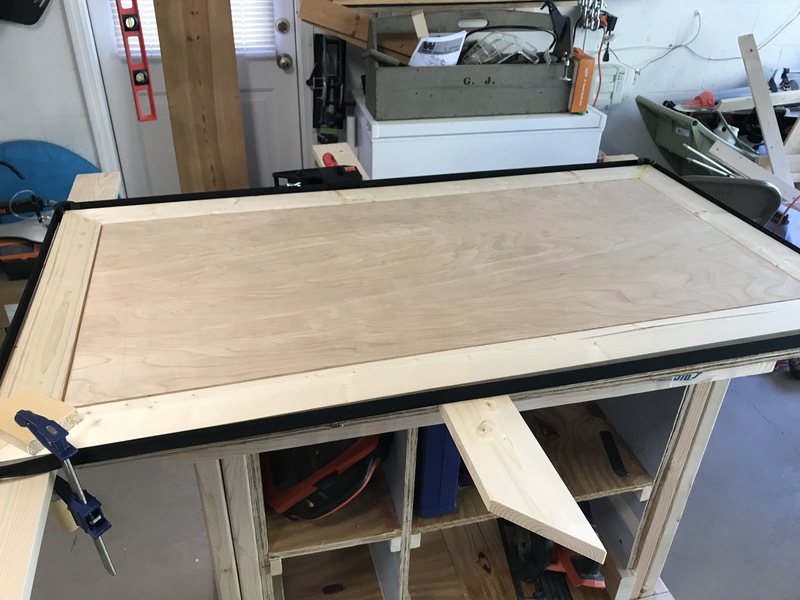 After putting some support pieces on the bottom frame, I flipped the table top upside down, lined everything up, and put the table together. 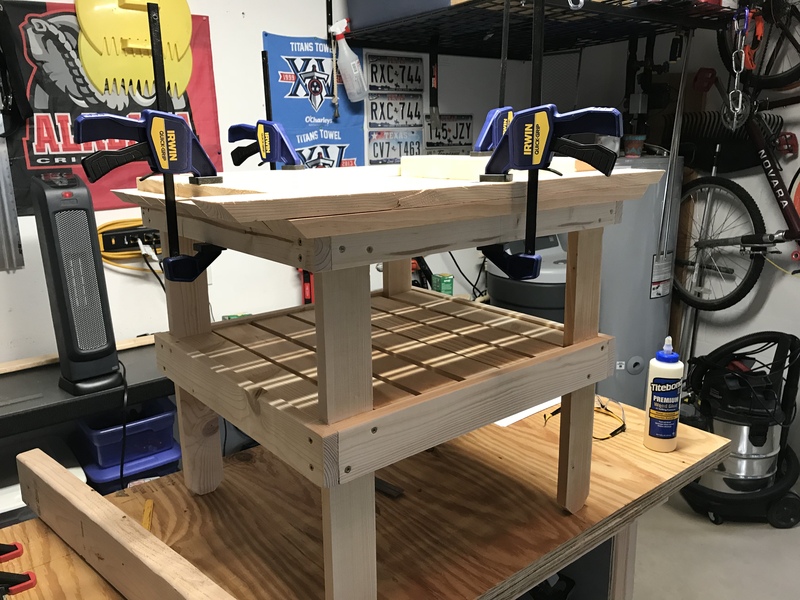 Using the support pieces, I screwed the top onto the bottom while the table was flipped upside down. 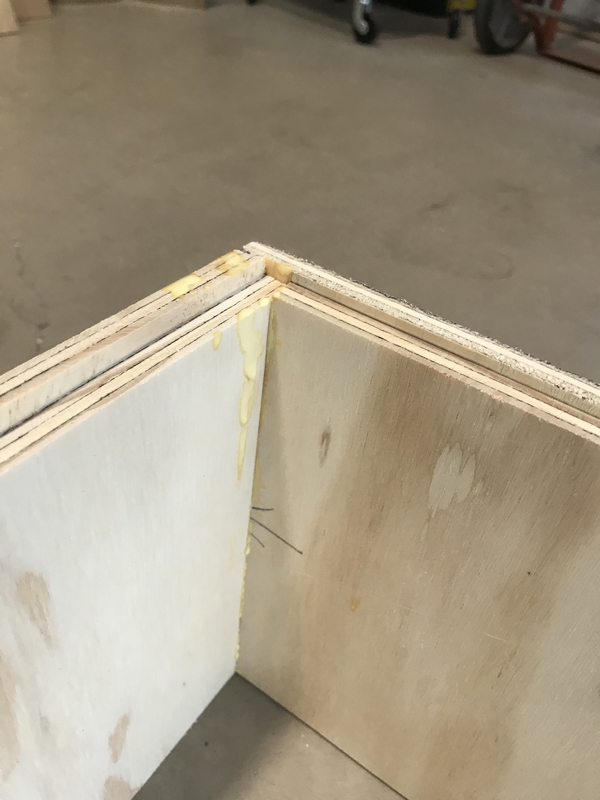 The plywood has been glued and screwed. 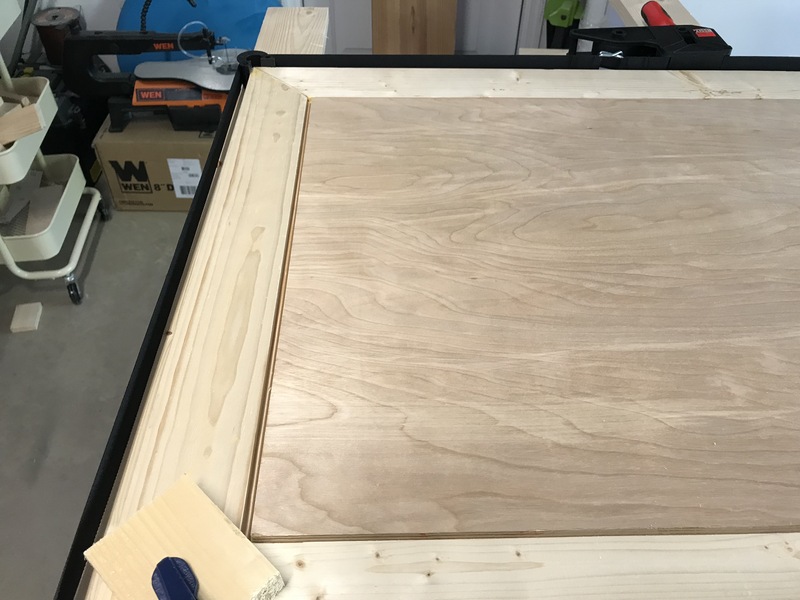 The process of gluing in the table top. 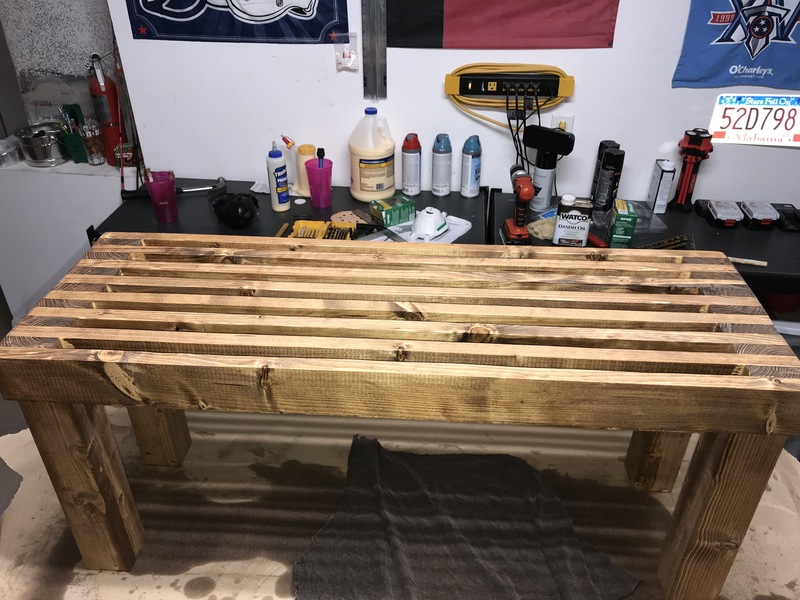 I finished the piece by using Danish Oil. 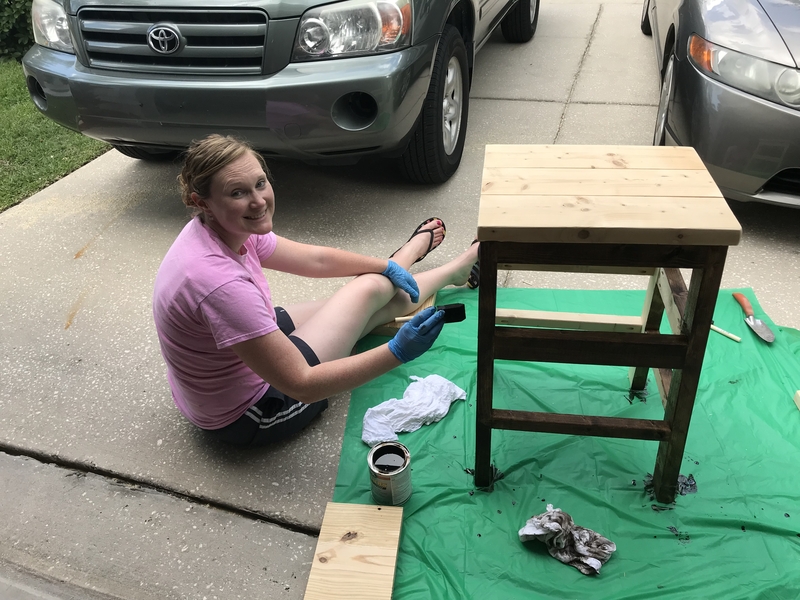 I put down a coat of natural wood color, and then put two coats of dark walnut color. After letting that thoroughly dry for about 3 days, I applied a spray polyurethane, about 4 coats of it. Finally putting coats of the Danish Oil finish on to the table. I’m really proud of this piece. I had a lot of struggles with it. 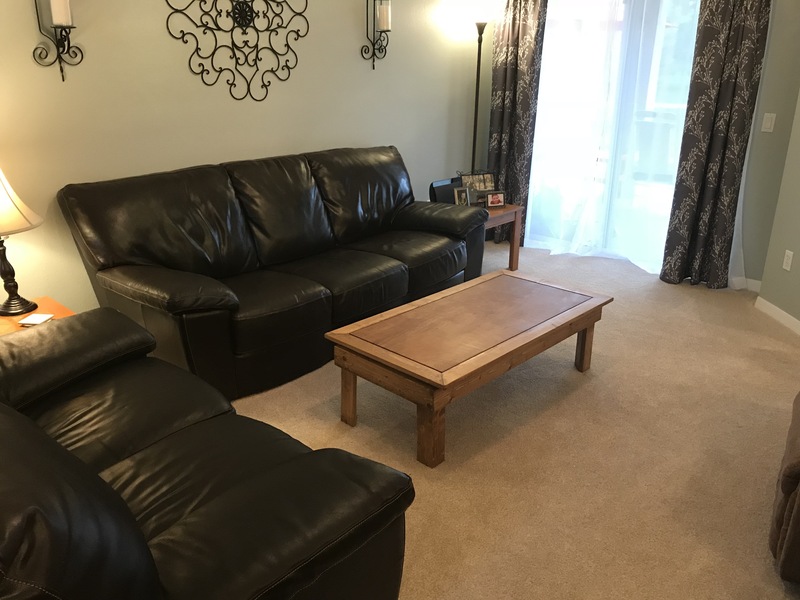 I think it looks really good inside our living room area. 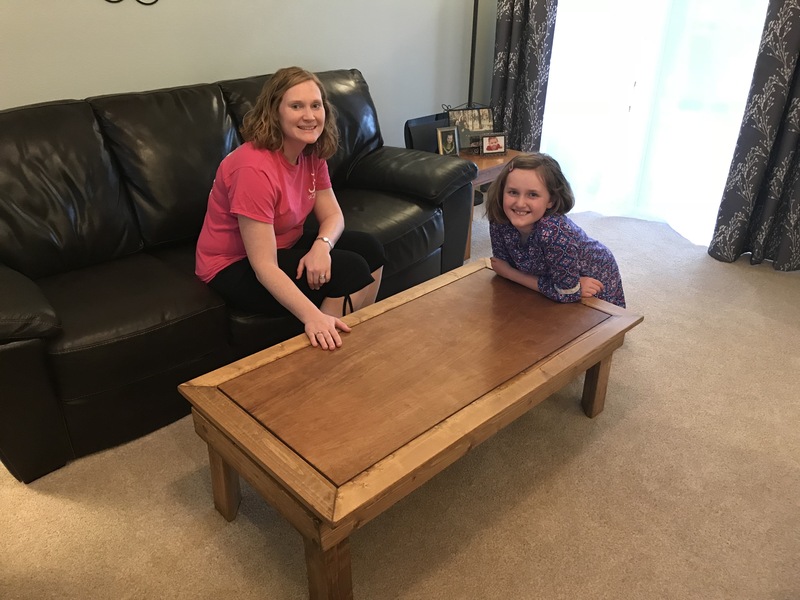 The family loves the new table! 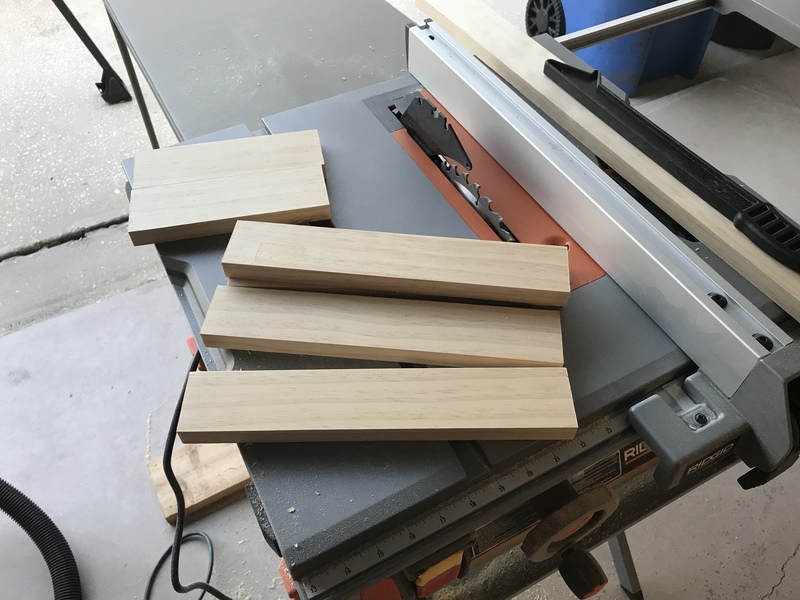 Once again, I’d like to thank Steve Ramsey for doing such a great job teaching on his Weekend Woodworker course. I would have never had the ability to do this without his teaching. 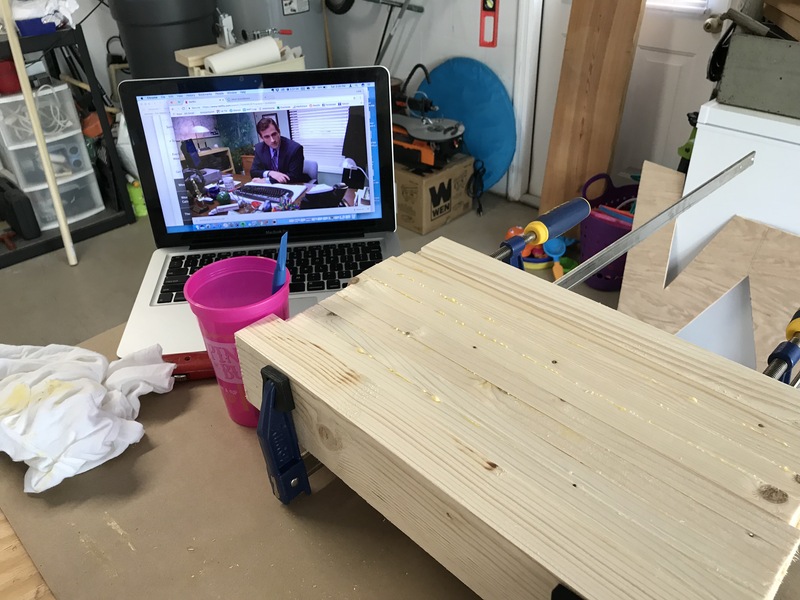 I’ve been taking part of an online woodworking course called the Weekend Woodworker led by Steve Ramsey. It has been great fun, and I’m learning how to do a ton of awesome things. For my 4th and 5th projects of the year – one of them was part of the course, and one of them was not. 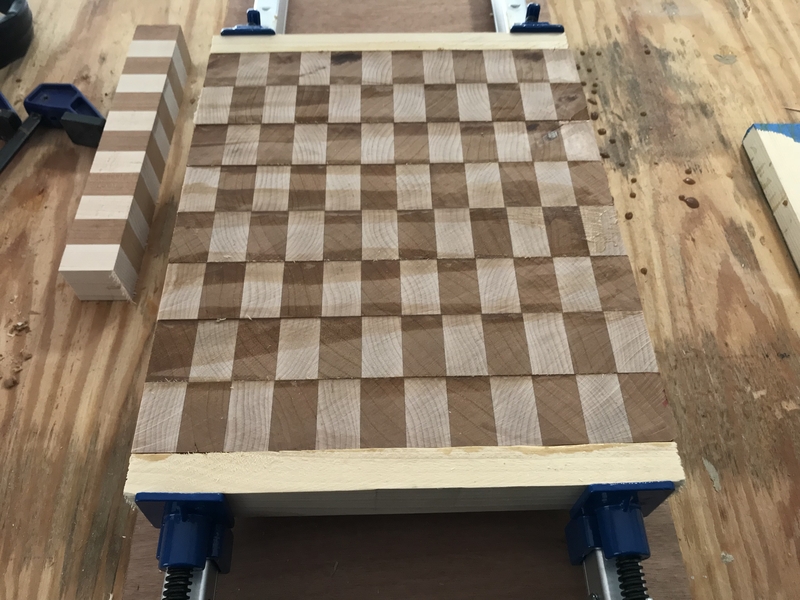 The last step was to make a paperweight – which consisted of just gluing up two boards together. You’re supposed to add personalization to it, I just haven’t gotten around to it yet. 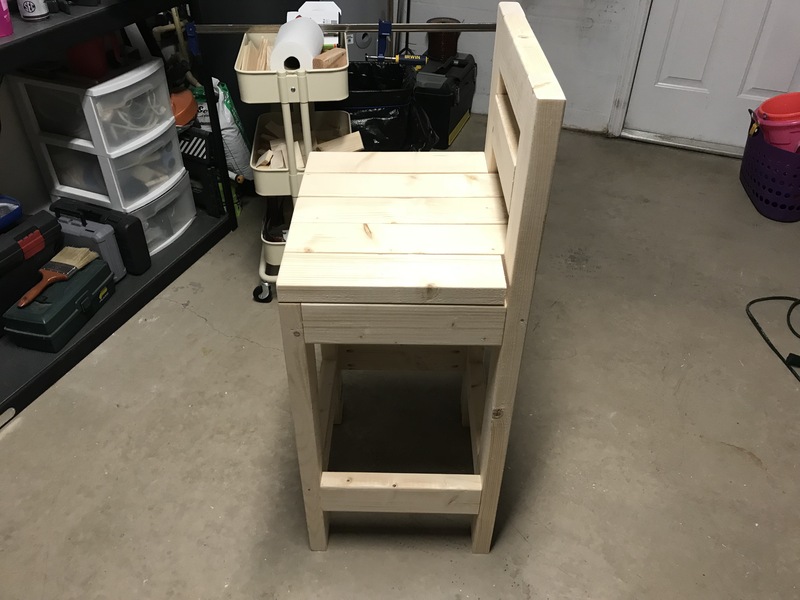 After I made this, I thought it was time to try something not part of the course – and we’ve been needing some barstools for our kitchen area. 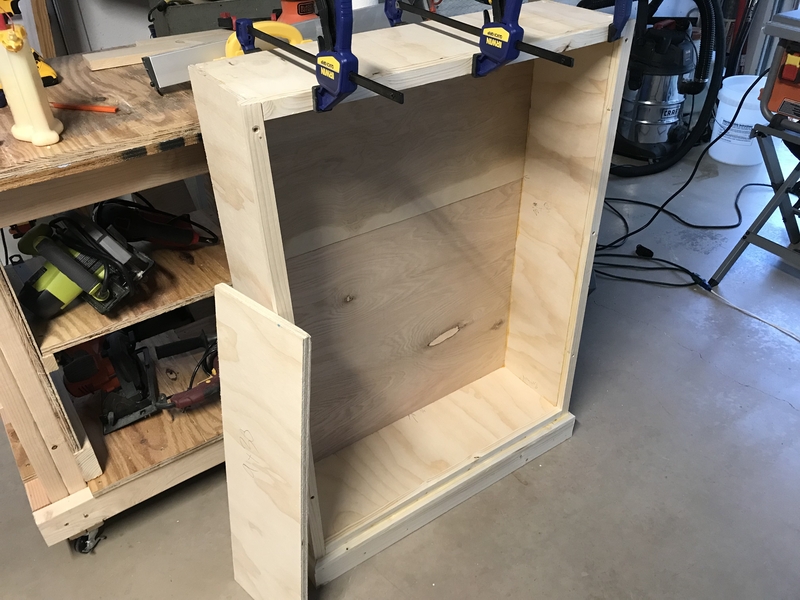 This project, I was finally going to use pocket holes. 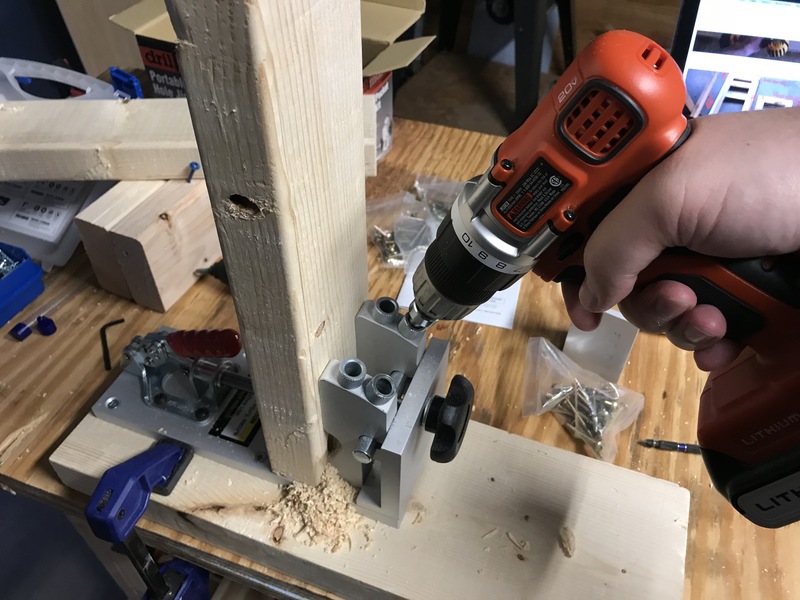 I don’t have an expensive “Kreg” jig, but rather I had purchased a pocket hole jig from Harbor Freight. 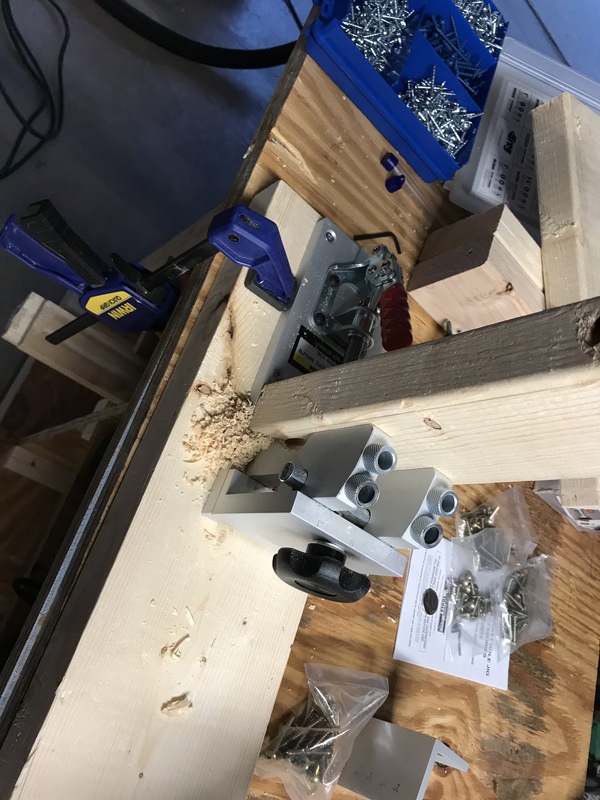 The only thing I don’t care for about the HF jig is that I can’t adjust the height of where the holes go in the board. It ended up working out just fine for this project, but I can see where in the future it may restrict me from using them in all projects. 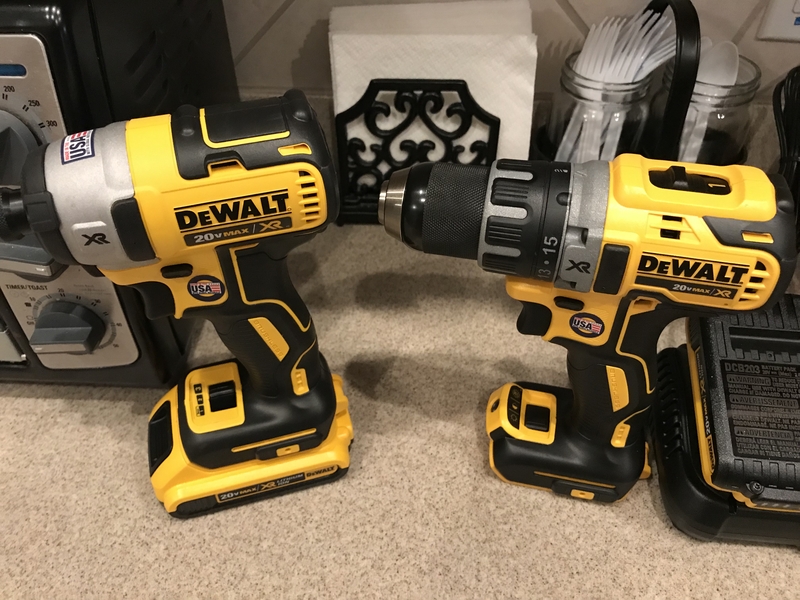 I am using the Kreg brand screws – they were a gift from my wife at Christmas. 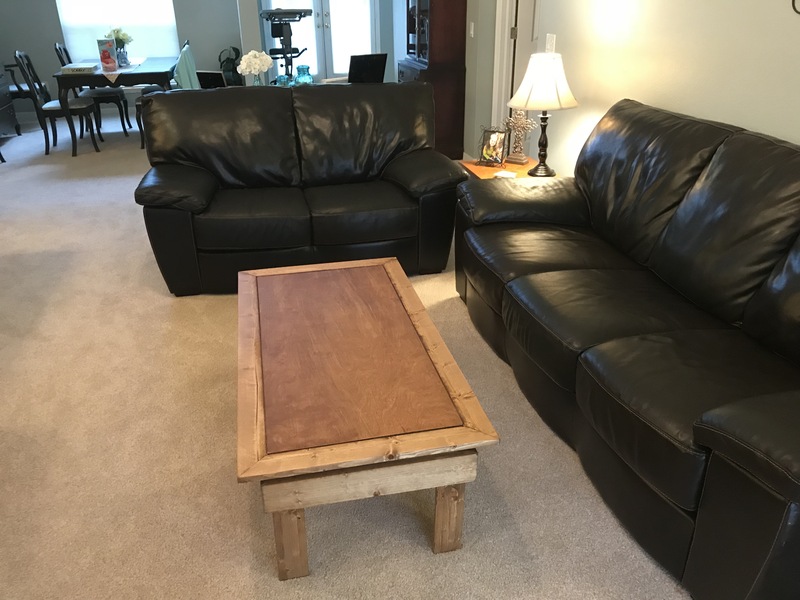 The chairs will fit perfectly in our kitchen/living room area under the kitchen counter. 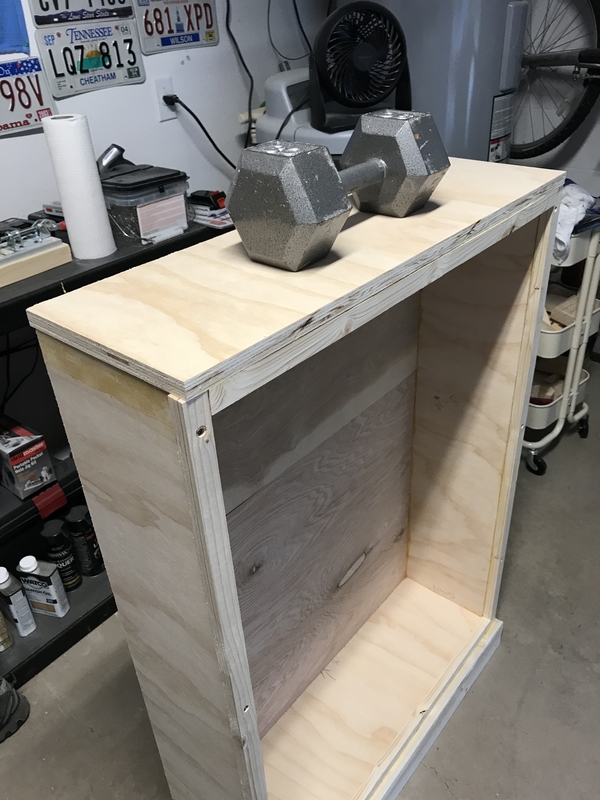 However, they are a bit clunky – so I may go back to the drawing board and make something a bit less of a large footprint. 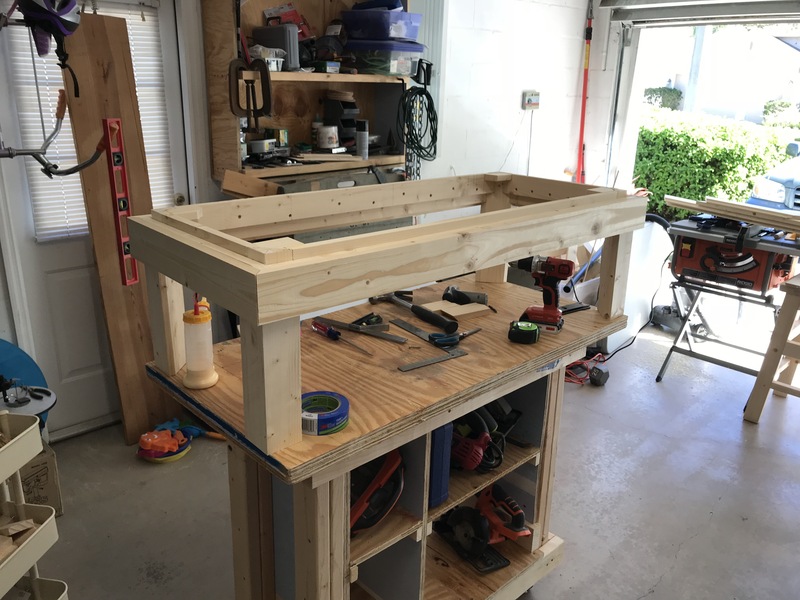 Regardless, even if we don’t use it in the kitchen area, I now have a great seat for my garage/workshop area. Tonight is my last night to be in my thirties. I’ve done a whole lot in my 39 trips around the sun. I’ve been to Honduras, Nicaragua, Belize, Canada, England, Scotland, France, Germany, Belgium, Amsterdam, China, Japan, Jordan, and Israel. I’ve lived a lot of places: Lebanon, TN; Henderson, TN; Houston, TX; Ashland City, TN; Memphis, TN (technically I lived in Olive Branch, MS too); Guntersville, AL; back to Houston, TX; back to Nashville, TN; and now in Tampa, FL. I’ve owned a 97 Pontiac Sunfire, a 2002 Ford Taurus, a 98 Ford Explorer 2 door Sport, a 2001 Honda Accord, a 2004 Honda Pilot, and now a 2006 Honda Civic. I’ve been married for 14 of those trips around the sun. I’ve been a father for 9. I’ve paid off all of debt except for my mortgage. I’ve struggled with anxiety and very low self esteem. I’ve played rhythm guitar, bass guitar, and drums in a band. I’ve been in 14 plays, musicals, etc. I was one of the lead roles in about half of those. I’ve only owned my own dog for about 3 years – Chloe, our little black pug. I really hope to own another dog one day. I only ever attended a Christian school. Friendship Christian and Freed Hardeman. I also taught in a Christian school – Westbury Christian. I’ve never had a sip of alcohol. I’ve never seen Terminator, Die Hard, or The Godfather. I’ve driven a bus from Tennessee to Canada and back. It was a 26 passenger bus. I’ve been on television at least 4 times that I know of. I’ve seen the Great Wall of China. I landed in Tokyo the day the great tsunami hit Japan on my way to China. I’ve seen Les Miserables in London 3 times. I’ve been bald since I was 18. I can’t sleep without a fan. I once bench pressed 225 lbs. When I was about 5 years old, I sang “You’re Never Fully Dressed Without a Smile” as loud as I could while showering the bathhouse at a campground. My family called me “Motormouth” when I was a child, because I never stopped talking. I’m being punished for that now because my daughter does the exact same thing! I asked a White House security guard while on a tour if there was an underground bunker for the president to hide in like on the show “24.” He was not amused. I have been bullied as a child and also as an adult. I have preached from the same pulpit that Alexander Campbell once preached from. I’ve watched “The Office” from beginning to end probably at least 9 times. I took a selfie with Kirk Herbstreit. I have hottest wife in the entire world. For all of those who have been an influential part of my life up until this point – thank you. 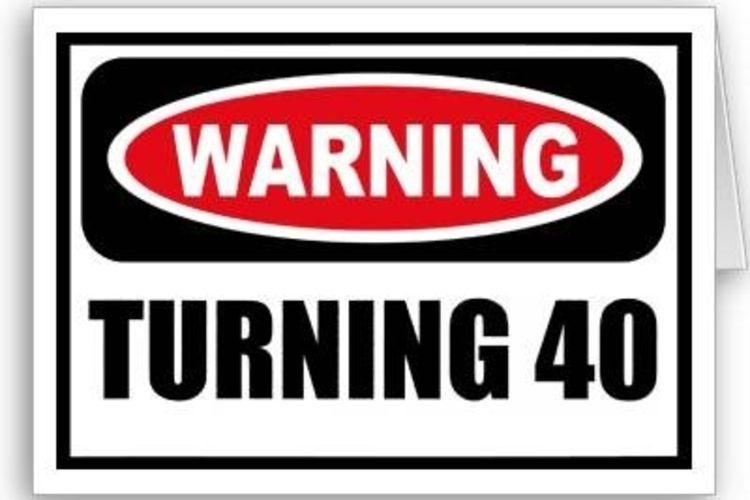 Bring it on 40! 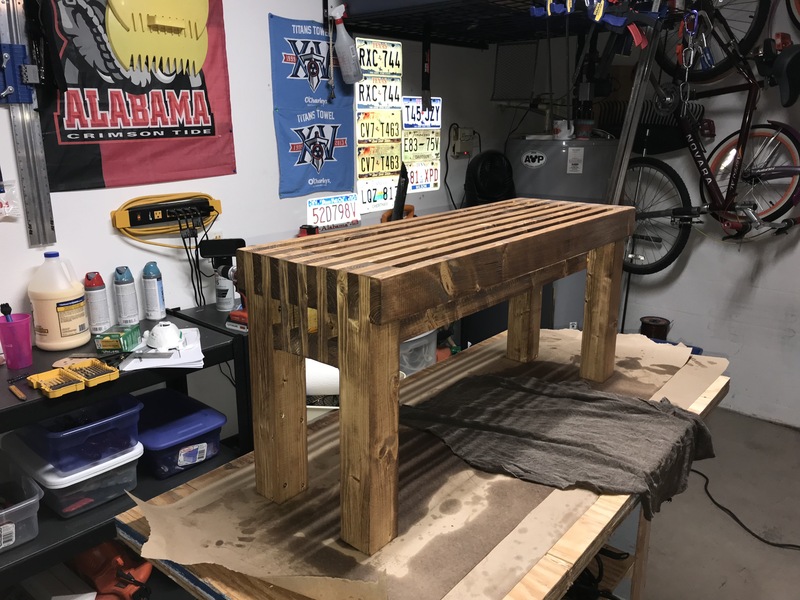 Build Project #3: A Bench for Our…. 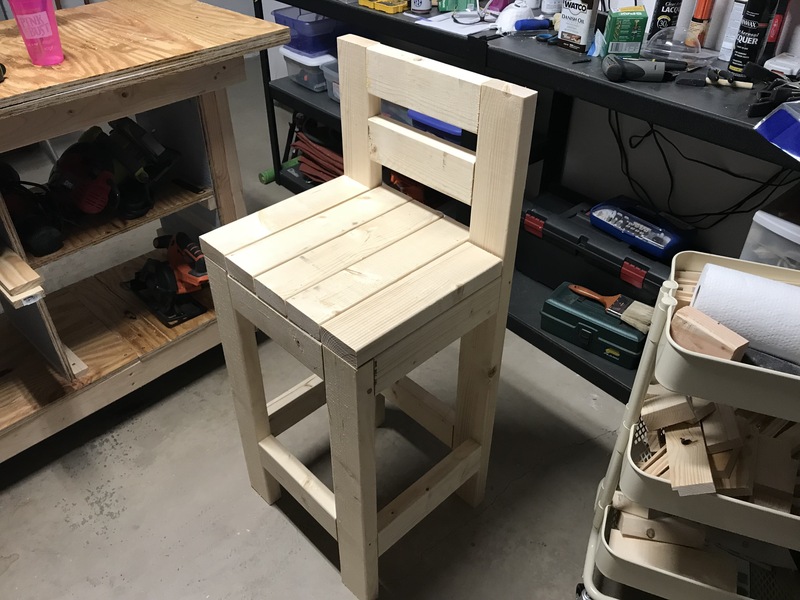 In my year of woodworking projects, a lot of it is learning. And I’m learning that wood glue can be pretty daggum messy. 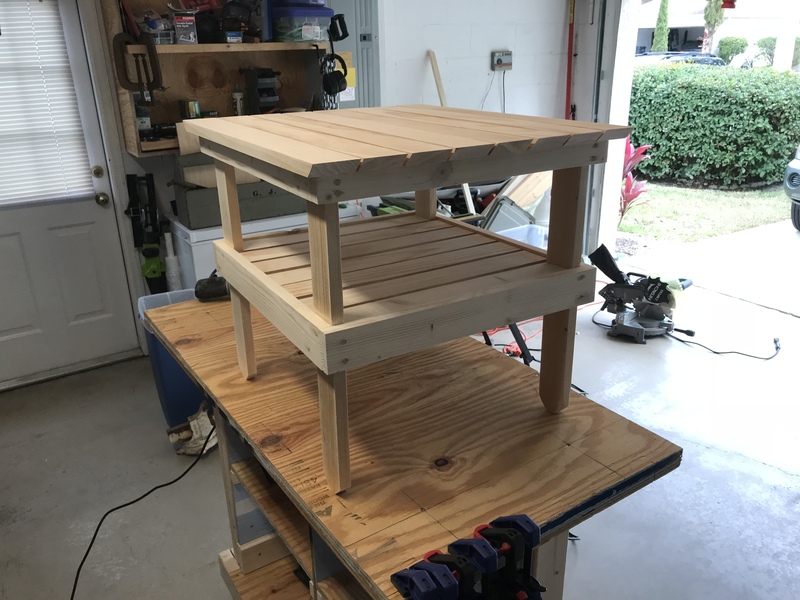 My 3rd project of the year is a bench. I haven’t yet figured out where this will go. 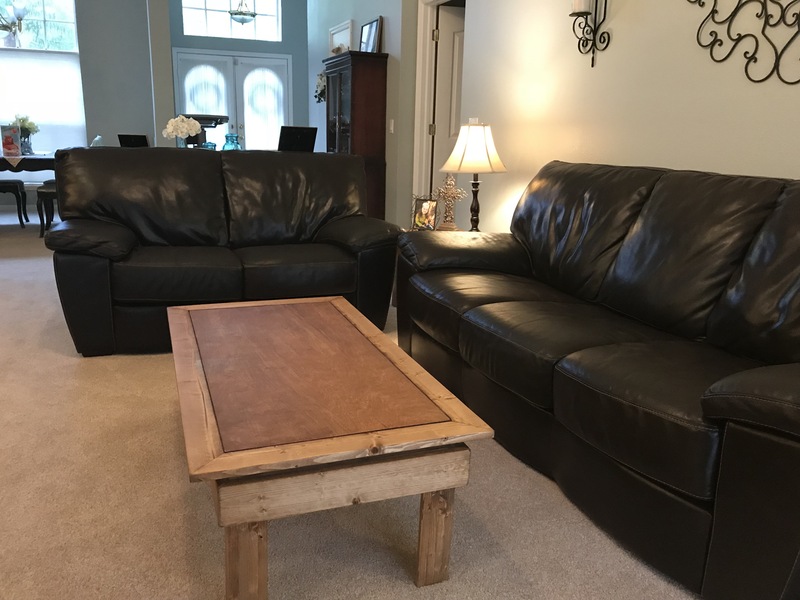 It may go in our room as a place to sit while putting on shoes. 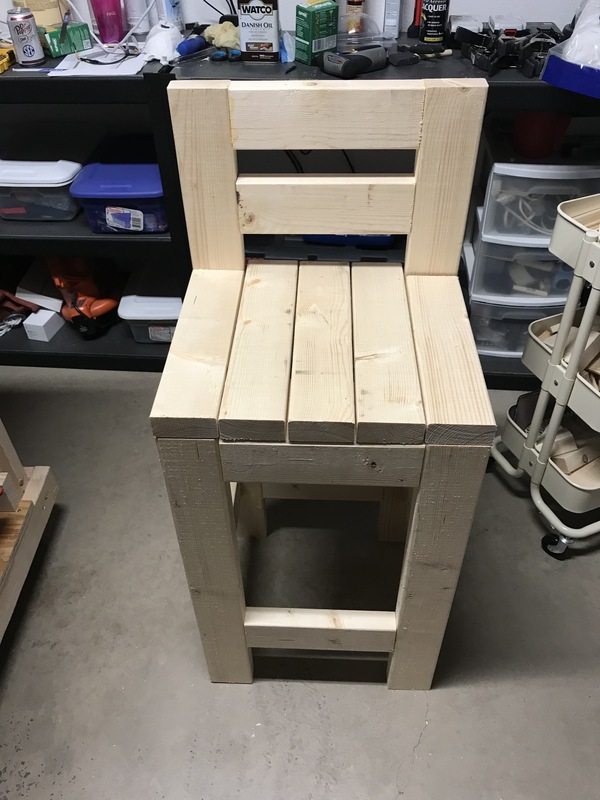 It may go in my wife’s classroom for her to use as a reading bench. 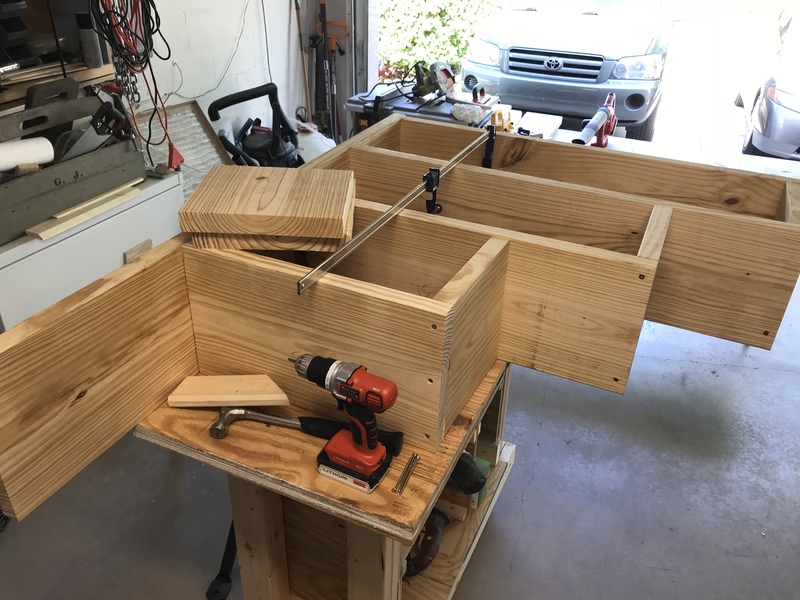 I have to admit, I didn’t get as many pictures of the build process this time. 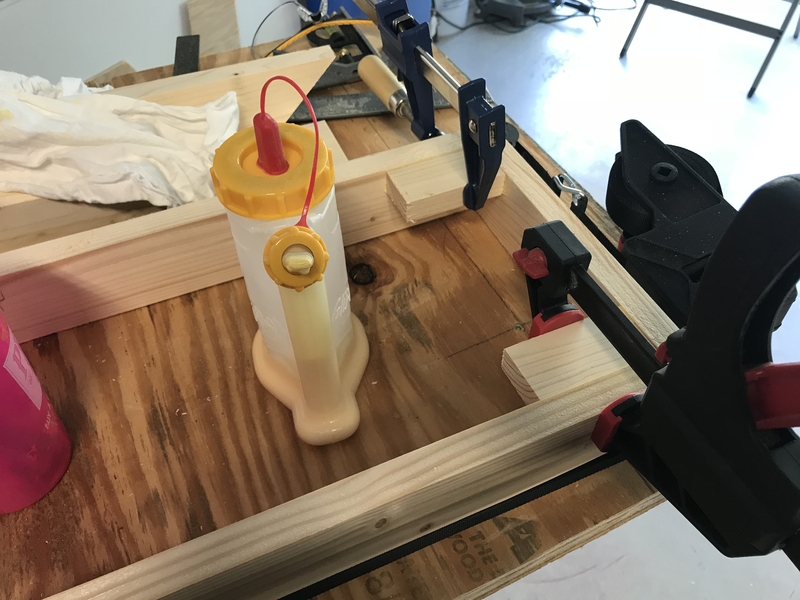 The reason – well, a lot of this build was gluing and sanding. That’s not exactly the most exciting stuff in the world. 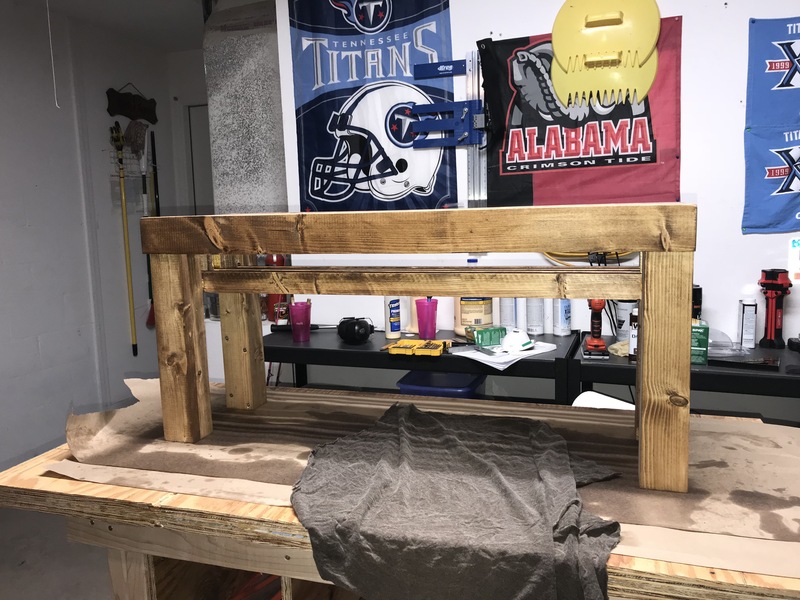 The goal: turn this stack of wood (well, part of it) into a beautiful bench. 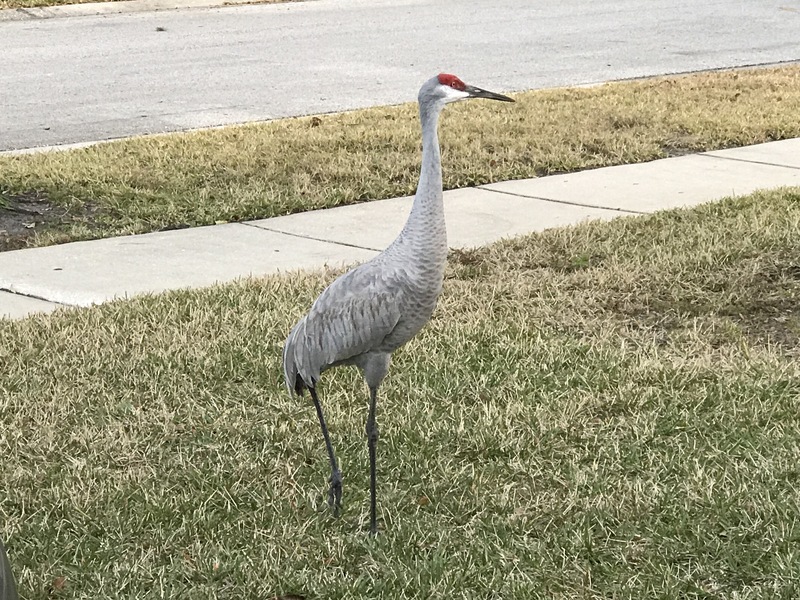 Sand Hill Cranes are a truly beautiful species. 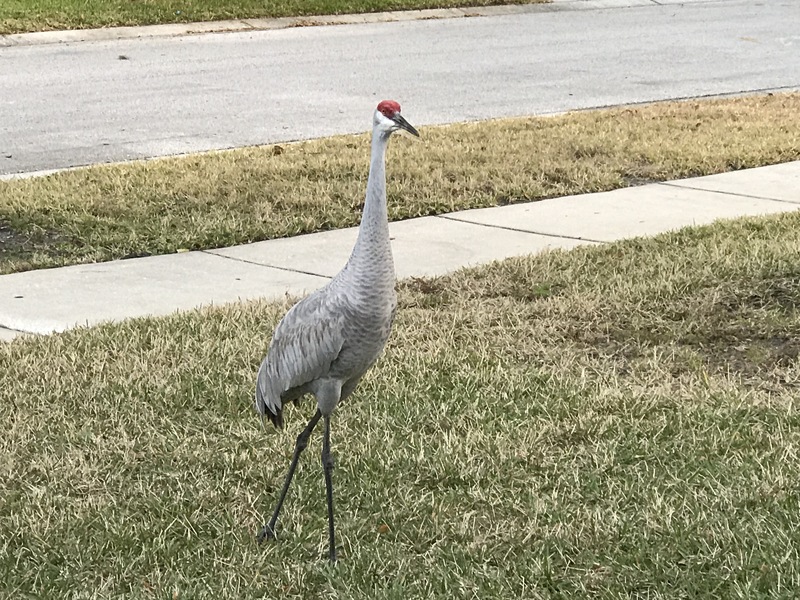 They make one of the most amazing sounds of any bird I’ve ever heard. They also mate for life, and return to their home each year. Josie calls them Sandy and Bill. 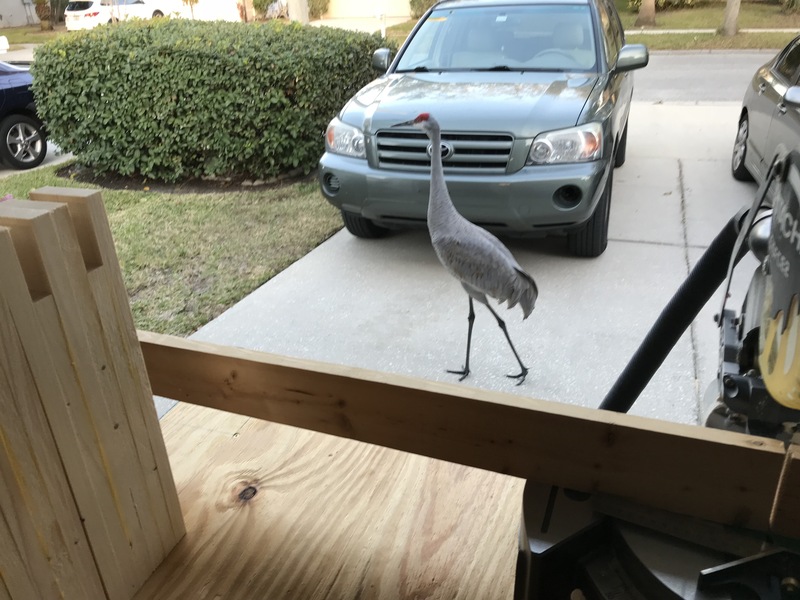 We have a beautiful back porch that overlooks a small lake here in Tampa. We have a hammock, 2 rocking chairs, and a glider that belonged to my grandparents in Nashville. But the one thing we didn’t have was a table to sit next to those things while we were enjoying a beverage and the view. 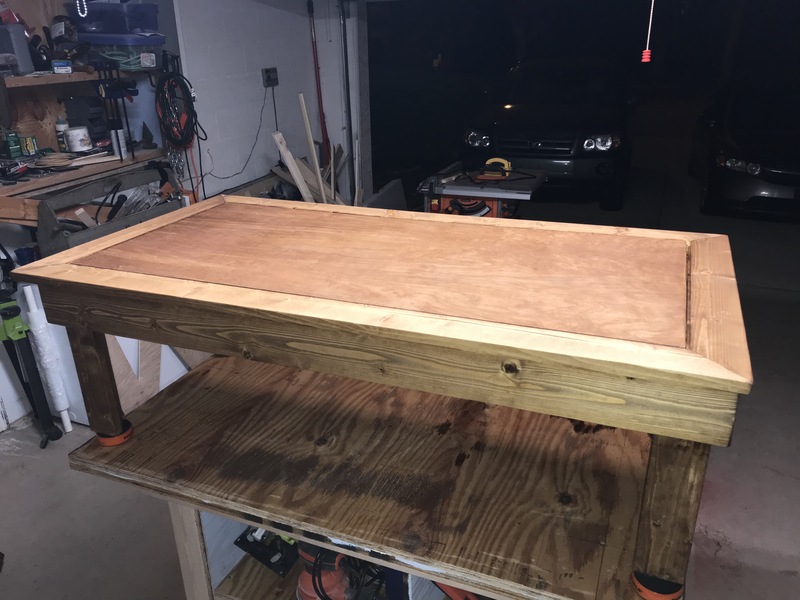 So it was time to build a table. 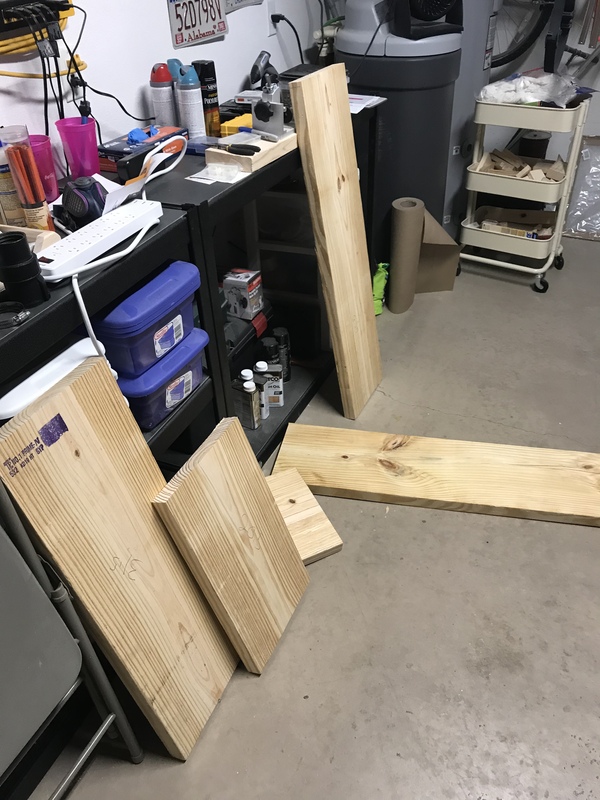 I went to the local Lowes store to buy some simple pine boards. 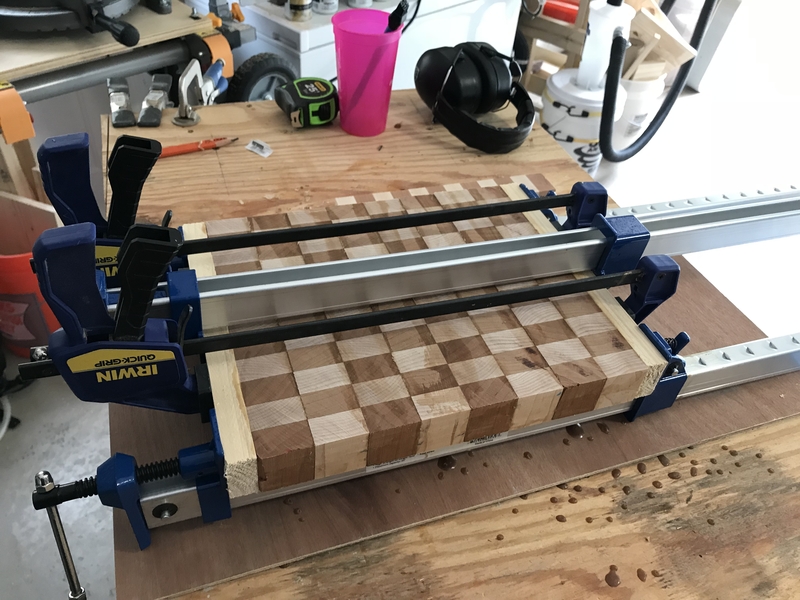 This project was made out of 1x3s and 1x2s. 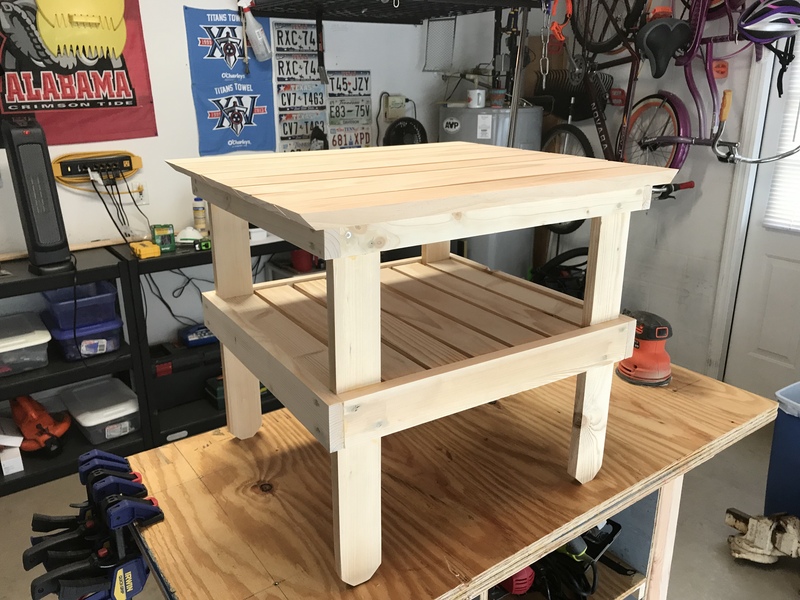 All in all, this was pretty simple to make. Again, credit for the plans goes to Steve Ramsey and his Wood Working for Mere Mortals site. 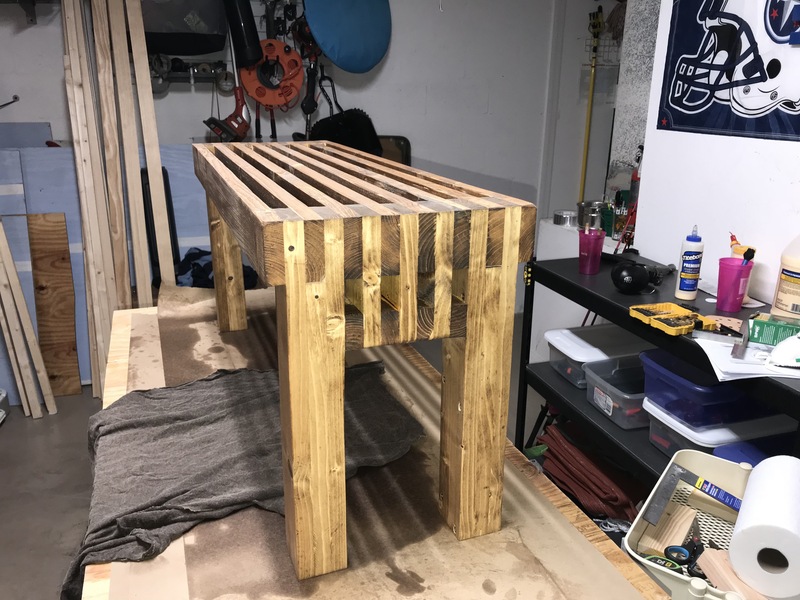 This table was a lot of fun to build. 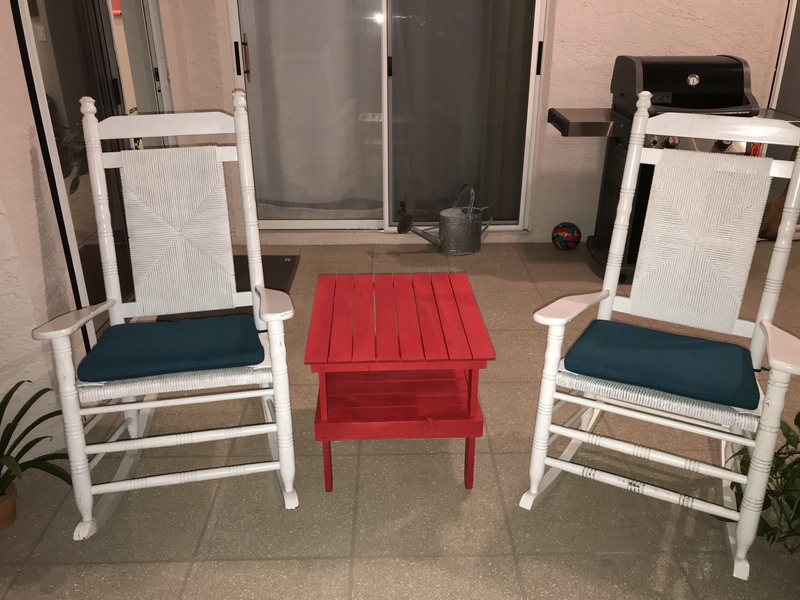 It matches our porch perfectly, and is fun, casual, simple, and will hold many a Diet Dr. Pepper on it in the future.